Work is sending me to the USA west coast, where they have put me up in a hotel pretty much across the street from California's Great America, home to the brand new and shiny RailBlazer! But... as CGA has operations that make Merlin look like Disney, the whole park will be closed for the entire time that I'm there, before I have to move onto my second work location. The second work location is in a state with 1 whole roller coaster and no direct flight back to the UK available. So to make up for this, I've routed my return to the UK to be from Orlando. Two weeks after my final business meeting. I'm excited as this will be my first time in Orlando, plus I will be there whilst Halloween Horror Nights is on. I'm still undecided whether I enjoy scare mazes, but having seen the overall atmosphere of Universal on these nights, I'm really looking forward to this. I'm staying one week on Universal property, where I'm intending to also go to SeaWorld and depending on whether time allows to Busch Gardens. 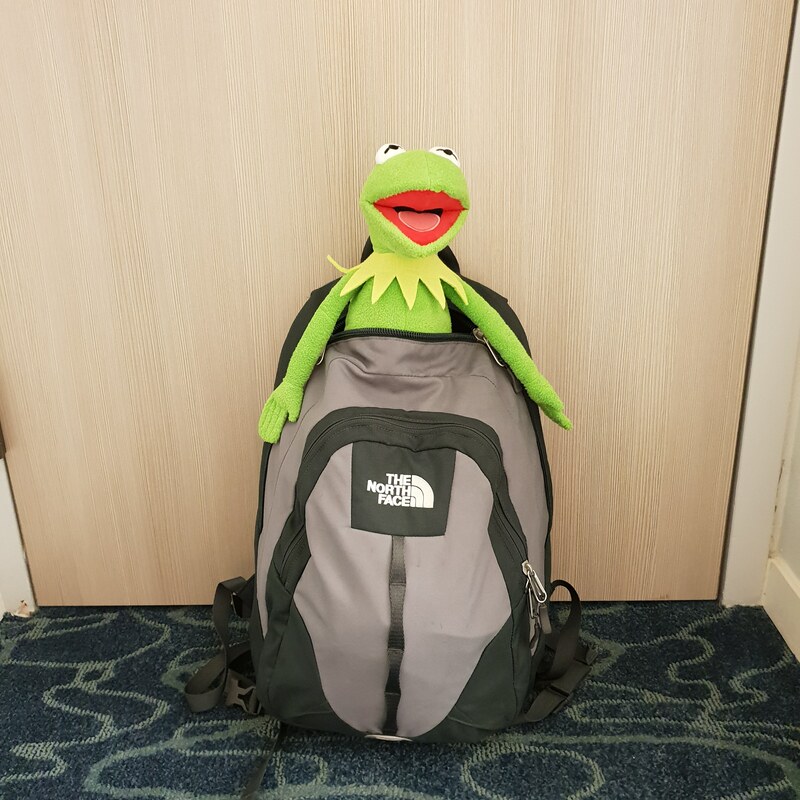 Then I transfer for 1 week on Disney property, where it will be purely Disney fun! I'm still trying to figure out how many nights to book Halloween Horrors for. I'm erring towards a "season" pass for the event, just so I can float in and out in a more relaxed way, rather than a mad rush on one night. Especially as some of the days I'm there it will be super peak, whilst others are likely to be fairly quiet. Should be really good fun, but it sadly means I will definitely be missing scaremazing this year. Edit: It's looking like CGA will be open for one evening while I'm there. 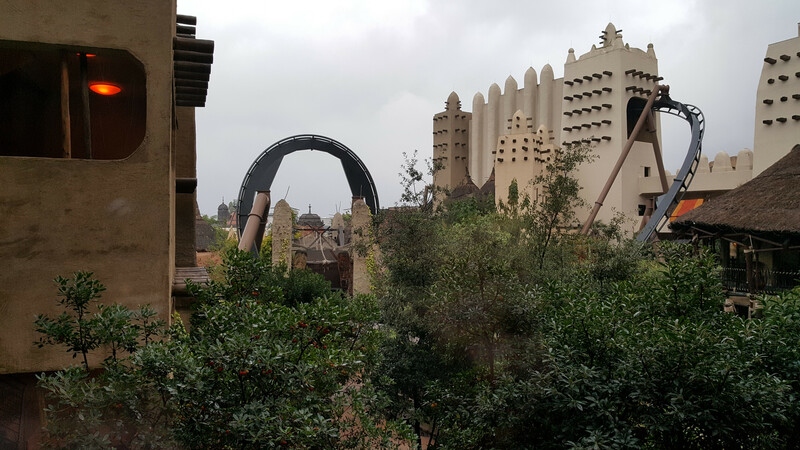 So I decided to take a last minute trip to Phantasialand for a couple of days. 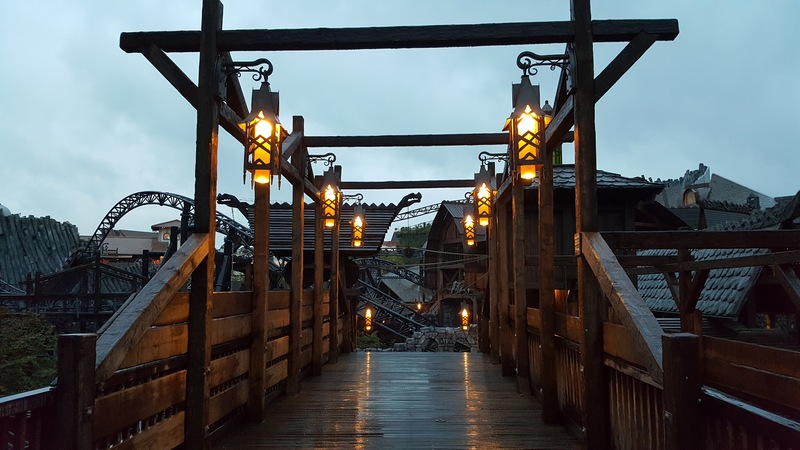 I was going to write just a little bit about travel advice and how I got here, but Phantasialand surprised me with an hour's ERT on Taron and Raik as soon as I arrived. So there will be a little more than just travel too! 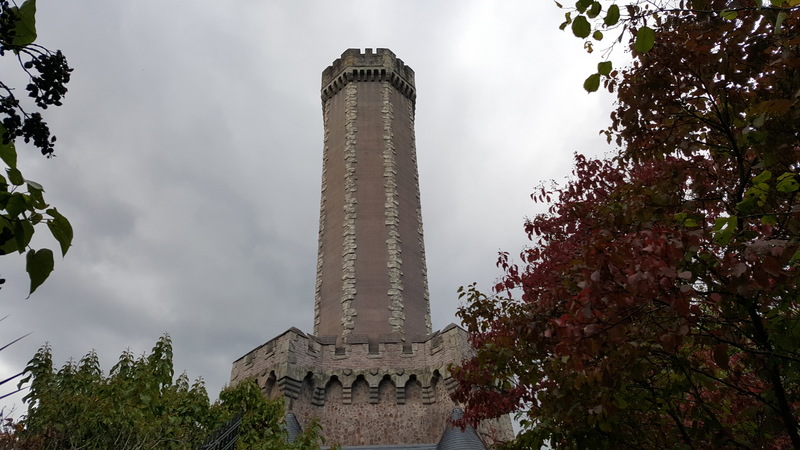 I took a taxi from the airport to Phantasialand, as I arrived at around 5pm on a Sunday and didn't want to play with public transport. Ideally I wanted to pay by card, so I used the MyTaxi app to order a taxi to the hotel and it arrived within a minute. Whilst MyTaxi is available in the UK I hadn't used it before, so here's a few pointers for those who also haven't. Firstly, unlike Uber you pay at the end via an action, so don't just jump out thinking you're all done! Secondly, if you tip, they will see it immediately. Thirdly, chances are your credit card will not work in Germany, because Germany really doesn't like credit cards. My credit card failed first time, making the driver a little nervous, so I reassured him that I'd preloaded with three cards and had cash worst case. My debit card worked and seems the more reliable option in Germany. 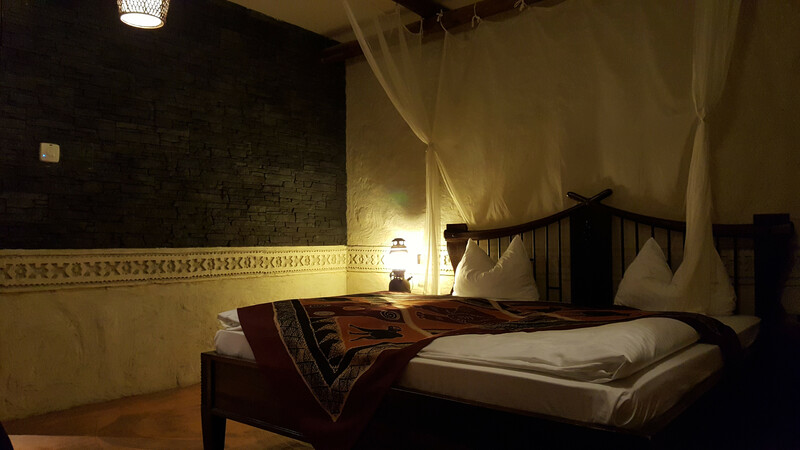 Staying at the hotel Matamba, which is a glorious African themed hotel, far beyond anything Merlin produces and rivals a lot of Disney hotels. Thankfully credit cards work here, as I still had to pay for my room. That's when they surprised me with fast passes for tomorrow, potentially the park being open an extra hour until 7pm tomorrow, oh and if I wanted, there's ERT right now for Taron. The website says you can only have ERT if you have a park ticket for that day, which I didn't. So with a huge smile I said, oh yes please, ran and dumped my bag in my room and legged it to Taron, taking this as my single photo from my room. For ERT you have to go through the hotel Ling Bau, straight out the back, around a pond and to the completely unmarked hotel entrance. You then walk straight until you get to this view. It is unlike anything I've seen in any other park. The last time I was taken back by theming in a park was Cars Land at Disney's California Adventure, and in particular the reveal of the mountain range from the side entrance. This blew that away, by some margin. Everywhere you look there is detail. Everywhere sounds. Everywhere Taron. So within 10 minutes of checking in I was in the queue for back row on Taron. I waited two whole minutes, because even though it was soaking wet and even though there was hardly anyone from the hotel in the park, they were running this at max capacity and getting each train out the door as quick as possible. The staff were visible happy. I was like a kid at Christmas! The ride. Oh my. So it was raining and it stung like anything, making some parts impossible to see where you are going. But even so, I don't think I could figure out the route this thing takes. It just goes where it wants and even with the restraint stapled the airtime caused me to feel like I was slipping out. Multiple times per ride! This was extreme and not like anything else I've experienced and incredibly fun. I cheered/woo-ed nearly all the way around, as did many others. I did it twice in a row, first time back row, second time row one from back, then I went over to Raik. Raik is a fun little family coaster, but it's not designed for someone with my legs. I had to sit cross legged in the front. I don't think I'll ride it again! Rode Taron for a third time, then spent 20 minutes just taking in all of the ambience. Nearly everyone riding tonight was an enthusiast it seemed, such a great crowd. So far I've seen this area and the two hotels and I'm in love with this park. This is really what Alton should be aiming for. Everything here is several substantial steps beyond anything Merlin has done. 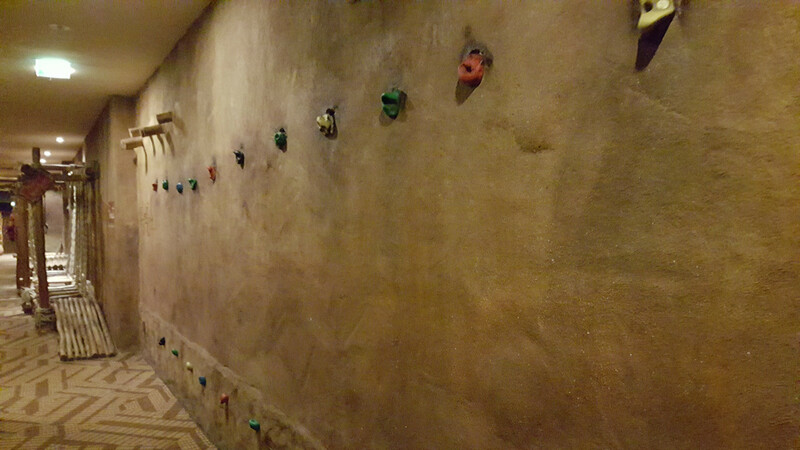 I mean, they have a kids agility course and small climbing wall, in a corridor in the hotel! So that's it from tonight. Now crashed out in my room, tomorrow I get to see the rest of the park! The excitement I got from this park in just an hour, was not something I've experienced in a very long time. Really looking forward to reading all about your trip! The anticipation from last night's excitement, did not lead to disappointment today when I finally got to see the full park. 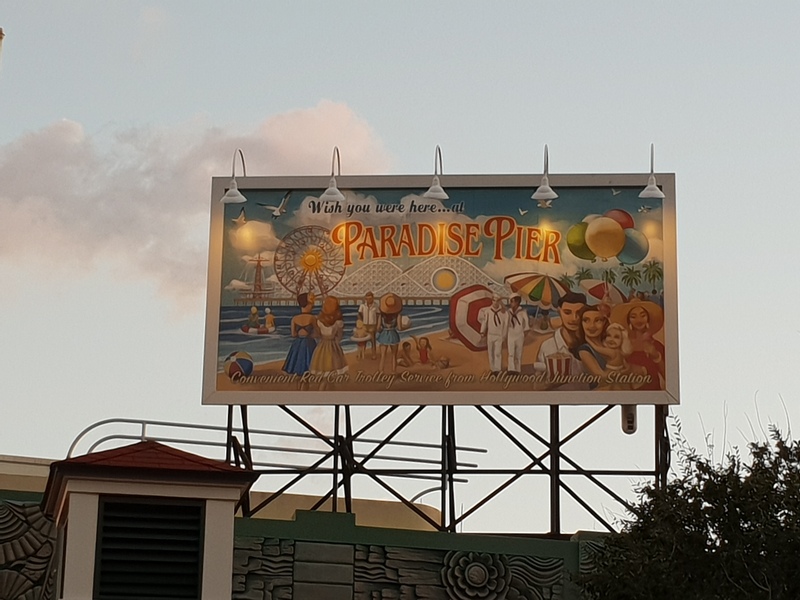 From the second you step foot into the park, until the moment you leave, the park is themed. Heavily. 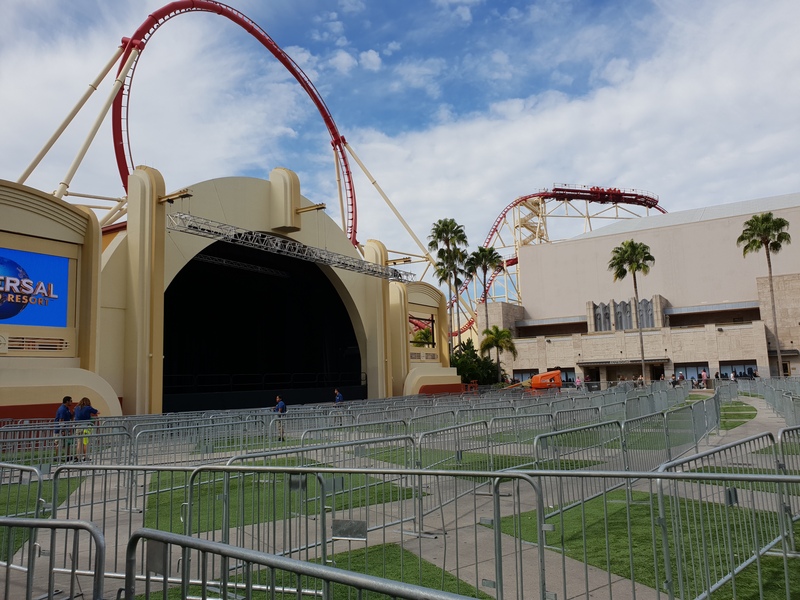 There is a noticeable divide between old and new in the park, with the old being largely relegated to just three rides: Hollywood Tour, the ghost Train, and Temple of the Nighthawk. Each of these rides have a perfectly working ride system (except for the slight leak issue Temple of the Nighthawk had yesterday), but the animatronics are a bit past their best, especially in Hollywood Tour. Queues were largely non-existent today. My longest wait was barely 10 minutes for Taron, but that was because I wanted to sit in the front row. Longest time I saw stated was 20 minutes. 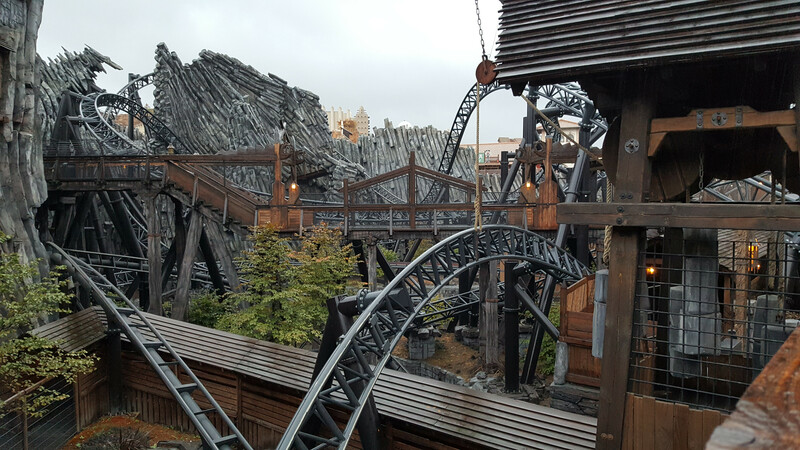 Taron is still my favourite, and after riding it 10 times during ERT, with several re-ride stints without leaving my seat (maxed out at 4 consecutive goes in the back row before they kicked us out as we were 10 minutes over the hour ). I'm not a fan of spinning coasters, but I enjoyed the two Winjas coasters, mostly for their unusual track pieces. I can see how you build a track that is springy or has a seesaw element, but I can't figure out how to do that safely! The way they spiral around inside is great fun to watch. Black Mamba seems very much a modern reimagining of Nemesis. Running through trenches mostly, it has a similar feeling of closeness to the ground as Nemesis, but it is not as intense, although just as fast. The way the station is set out with (from what my poor lowlight eyesight could determine) giant snakes being struck with spears, it really made me think that it was influenced by the Nemesis monster. I also did Chiapas, and got a little wetter than I thought I might. Although nowhere near as bad as nearly everyone else that I saw coming off afterwards. River Quest was closed because it was too cold, I think I got lucky that they still ran Chiapas. 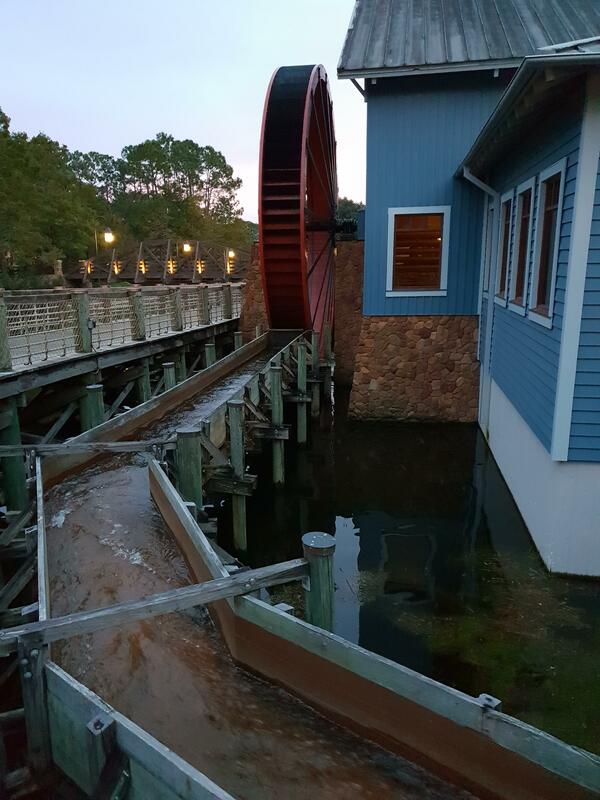 A fantastic modern log flume that just seems to go on and on. I was not expecting the musical scene! The final drop is fun, although I felt any airtime from the little bunny hop was lost by the restraints, which all slammed down in the empty rows locking my bag in. Finally for tonight Maus-au-chocolat. 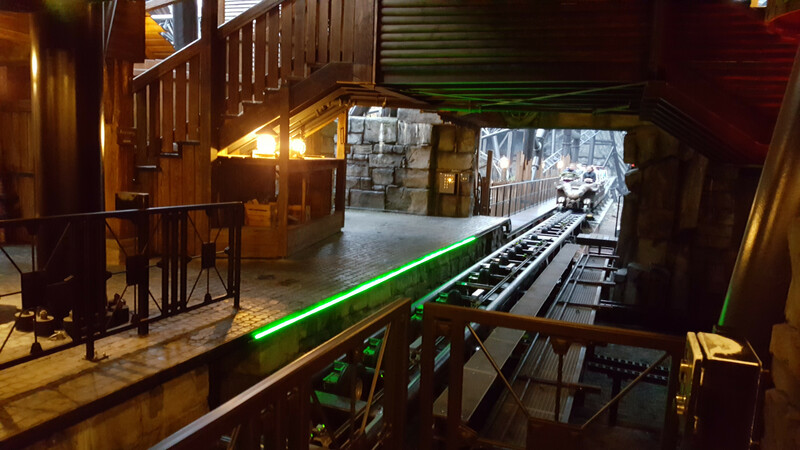 A tracked interactive dark ride, which has three spinning gondolas with seats either side, which stops at various points in the ride so you can shoot things on a screen in front of you. This is the dark ride style that we need Merlin to invest in. A fantastic mix of physical scenes, special effects and screens. It takes what Disney did with Toy Story Mania and I feel stepped it up significantly. The whole ride has purpose: get rid of the mice from the bakery. I rode this several times and it's probably my second or third favourite dark ride, behind Ratatouille and Transformers. I couldn't help but smile from the moment I entered the truly unique queue that takes you around the storage and bakery areas, until I left at the end. My body complained about two things this morning: firstly why did I climb so many steps the previous day and secondly if I was going to marathon Taron then could I please find a way of not having it cause my muscles to be pulled sideways by it so much. I cured the Taron issue this evening, by being extra specially relaxed and gliding with it into the corners, which with my feet swinging out on the turns, gave me the greatest feeling of flight from anything I've ridden. There was little I could do about the stairs though. 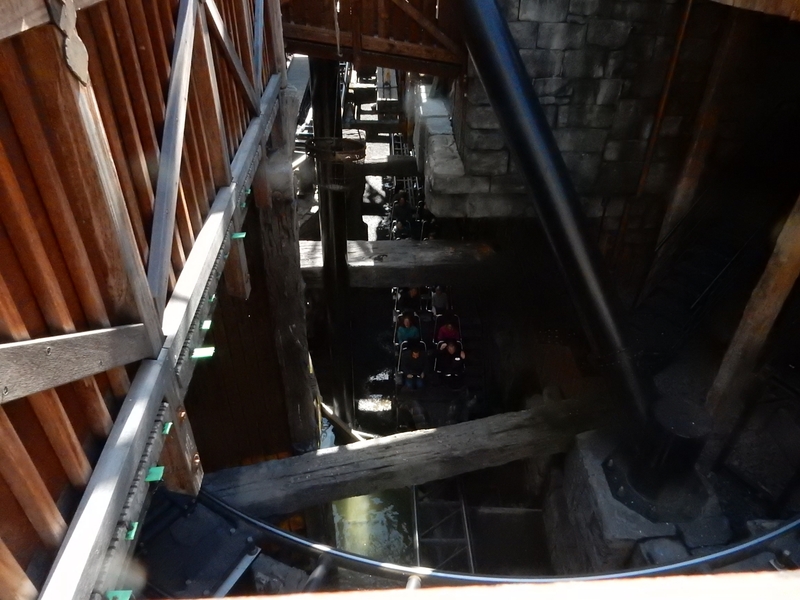 At pretty much any given point in Phantasialand you are on top of, or below, something else. Chances are you may not even realise it. But with this superb usage of space comes stairs. Lots and lots and lots of stairs. There is no getting around it, although if you explore off the main paths, and go up and down many stairs, you may find hidden things. 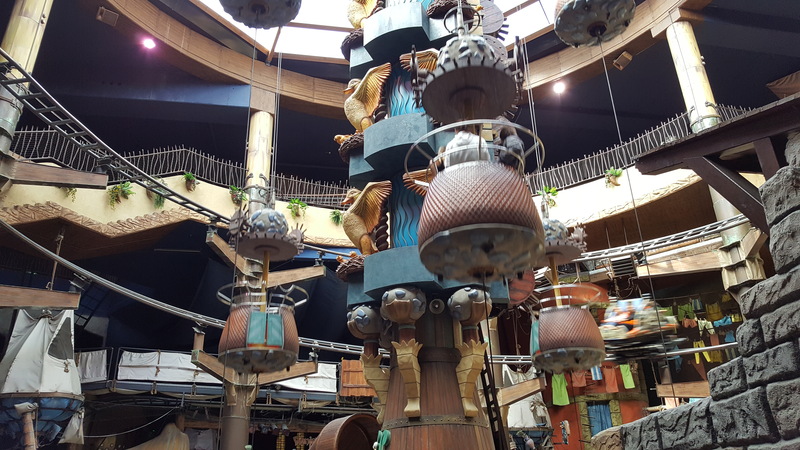 Phantasialand has been a wealth of new experiences. Today's new experience is certainly unique: colliding with a staff member, whilst I'm strapped into a ride. This made me really notice the difference in risk and safety between the parks here and at home. 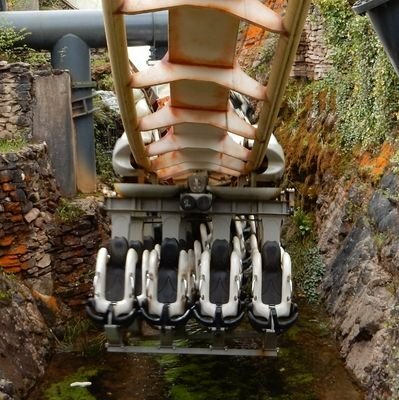 As a precursor, I'm not going to say that Phantasialand is unsafe, far from it, but that there is a difference in attitude and expectations. Ride staff are free to move around a lot more than at our home parks. Crossing the station is common and doesn't require operator approval, instead everyone has situational awareness. No ride requires station staff to keep a button pressed for the ride to release. In fact the only station with staff buttons is Taron, and once the train starts to move they don't need to hold it. During normal operation Taron staff walk alongside the incoming train, whilst during the ERT this evening they were all clapping and chanting with each trains release. I'd also always believed that as a rule, roller coasters could not be dispatched if all of the bars weren't secure. Colorado Express disproved that idea. Empty rows are left with the bars fully raised, the train happily dispatching. I'm not sure the same system is in place on any of the Big Thunder Mountain's. Then there is access to the rides. Taron in particular is so close to the paths that you can almost reach out and touch it. This is brilliant for getting an unobstructed view of the ride and really adds to the wonder of being a spectator. You can even look straight down into the end of the second launch. No netting, extended fencing or anything else you would expect a UK park to have to stop someone being stupid. It's refreshing to be at a park where the expectation is that the guests won't ruin it for everyone. So hopefully that attitude remains. So for the collision with the staff member. The Black Mamba crew all seem to love their job and have a very distinct way of gliding throughout the station unlocking, relocking and checking restraints. As I mentioned previously, staff have a lot more freedom of movement and at Black Mamba they don't have to be in a designated safe zone. So one staff member had made their routine to be stood in the ride area as the train approached, so he could unlock the restraints of the front row as they arrived. I watched him do it so many times from the queue, standing in the middle of the lowered platform at the exact stopping point for the front row, with such perfection. Then along I come and ruin it all, by kneeing him in the side as he misjudged the stopping point. We laughed, he apologised. Everyone went about the rest of their day. Having fallen asleep on the sofa at about 9:30 last night, I've somewhat recovered from my Phantasialand trip. So here are some final thoughts and a few pointers. 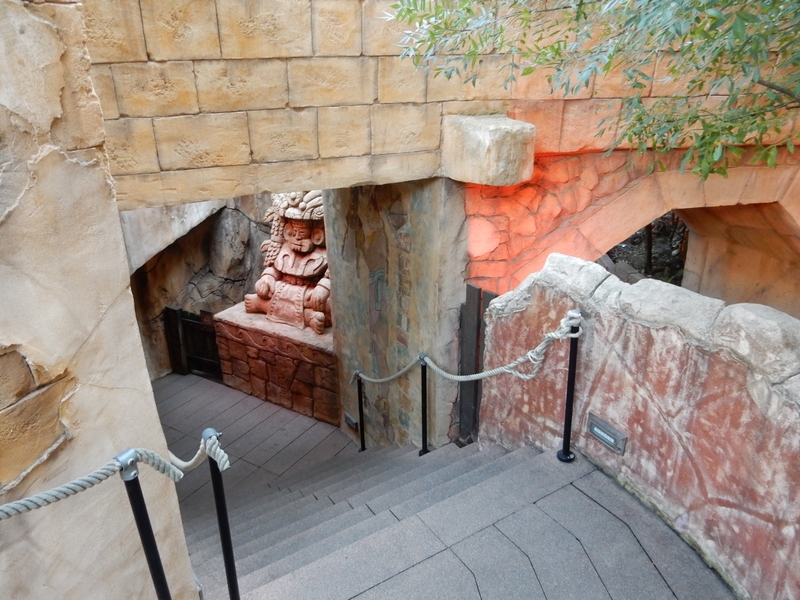 The level of theming throughout the park was remarkable. Klugheim is vast, yet there are so many small details everywhere. Buckets and items left in tucked away areas, village signs and many small sealed doorways, all give the feeling of it being a real living village. But even at the smaller ride end, this little ride had fantastic cars with spinning fans behind them. One thing I did notice was that none of the music really stuck in my head. Congo River Rapids, Splash Mountain and Wicker Man are all rides where the music was burned into my mind after one ride. I had to listen to both the Taron and Chiapas sound tracks again to remind myself and still they've not really stuck. Other rides like the ghost train and Hollywood Tour lacked any real audio to note. Food was very good throughout the park and hotel. The buffet breakfast was fairly normal on the continental side, with croissants, pain au chocolat and fruits. The cooked side had various eggs and omlettes to order, with the Hotel Matamba offering some items that I suspect are unique to its buffet, with mini boerewors and a strange toasted flat bread wrap with a tangy cheese filling, which I forget which African nation they said it was from. For dinner I ate at both hotel's buffets. Theming wise, the Matamba's buffet was far better, with the Ling Bao's buffet interior being far more normal restaurant like. However, I far preferred the food from the Ling Bao buffet, with options from Japan, Thailand, Vietnam and China. 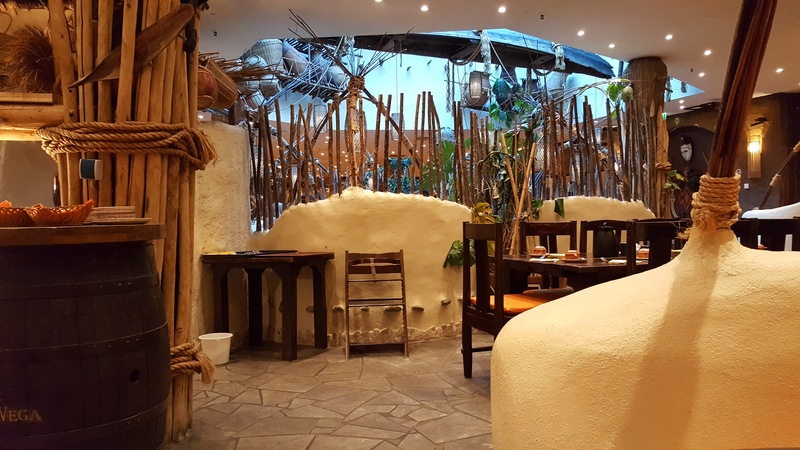 Both had cook to order items, with the Matamba buffet offering various grilled meats including crocodile, and the Ling Bao's buffet offering stir frys plus a dessert maker. I would recommend booking dinner at the hotels though via email before you travel. The restaurants aren't that large and even during off-peak periods they do fill up with corporate events, meetings and conferences. In the park there were various stands offering normal theme park burgers and pizza, along with restaurant options at the Ling Bao, Klugheim and a sandwich shop in Berlin. There were also many fruits and marshmallows covered in chocolate, however I did notice many wasps in them every time I went past. 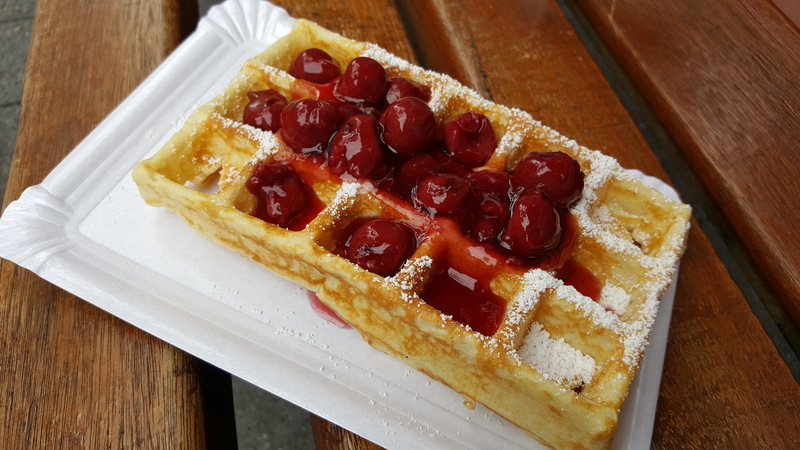 But it was the waffle shop that caught my eye when I first entered the park, and it did not disappoint! 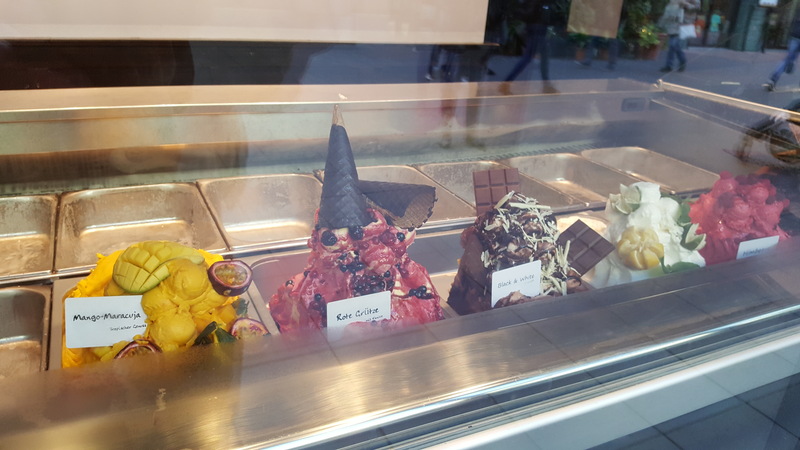 It was too cold for me to have ice cream, but there was always a long queue to get at its window! Fairly sure the other window that was open had more options. the peak summer season, was an hour's ERT on Taron and Raik every evening. This was eerily similar to a TTSP event ERT, with everyone immediately following the etiquette of you can stay on if there's no one waiting, otherwise it's a (literal) run out the exit, up the stairs, past the restaurants and bemused non-riding onlookers, back over the bridge and into the single rider queue line again to try and get the next train. The event was empty enough on my third evening that our train did 6 runs without anyone leaving their seat. The staff were brilliant; cheering, clapping and laughing as they sent us off for another go around! Managed 10 or more goes on both my second and third evening, with a total number of Taron rides during my stay approaching 30. I ache a little! I think I've covered most of the rides previously, but there is one I missed: Mystery Castle. A "bungee" drop tower. I'd only ever done the little things in the Dungeons before, so I was interested to give it a go, although a little nervous it has to be said. The building is impressively tall and can be seen from most points in the park. However, I'd seen videos of the ride and it didn't look like it went that high, certainly not as high as the building, which must all be for show. With a brief glance at the information board, where it announced it travels 65m, my imperial distance based mind went, see not that high. I reached the back of the queue and it turned out there were just enough seats for everyone except me to get onto the next ride. So I stood outside and listened to the loud electricity noises, the whooshing and then the doors shaking. Umm... If only I had remembered that Thorpe had put in its mid-term plan intentions for building 40m and 50m tall coasters, then the 200ft launch within seconds of the final restraint having been checked would have been far less of a surprise! I think I enjoyed it, but somehow I didn't feel the need to go back on. Overall a great park, which attracted people of all ages because of its mix of rides, ambience and shows. This really is what Alton should be and I hope that they continue to up their theming game otherwise they are going to get left completely behind by what these non-Disney European theme parks are now doing. 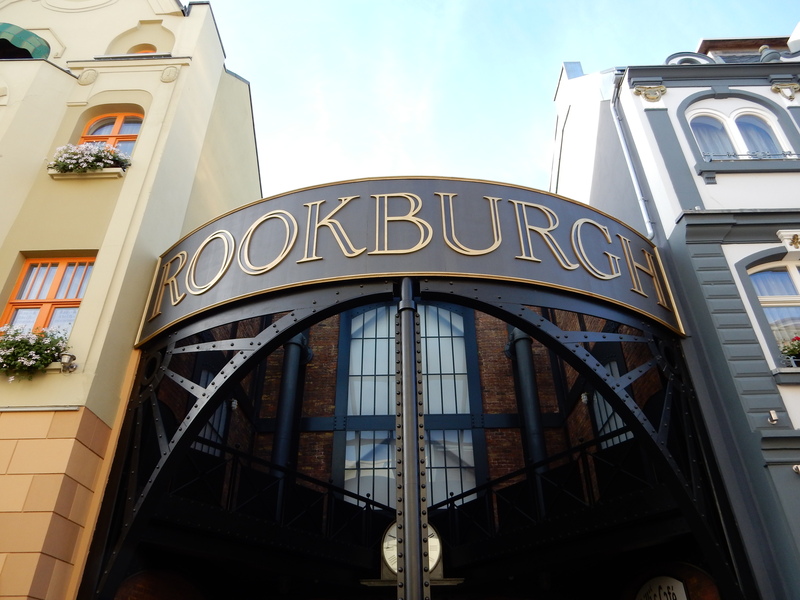 I'm looking forward to going back when Rookburgh opens. Even though I'm not a great fan of flying coasters, I'm sure it will be another fantastically themed land. I've come to the conclusion I don't particularly like Disney Fastpass+. Sure there are benefits to being able to guarantee a ride on a particular attraction, before you travel. But that's at the expense of having to micromanage your trip and have everything planned out long before you arrive. If you add in restaurant bookings and shows as well, you could end up with an hour by hour schedule for each day and no freedom to just enjoy. Then there is the attraction selection grouping. In some parks you can choose one key attraction only. So in Epcot, as there was a space on Frozen, it then prevented me from then booking Test Track, Soarin' and a couple of others at all that day. 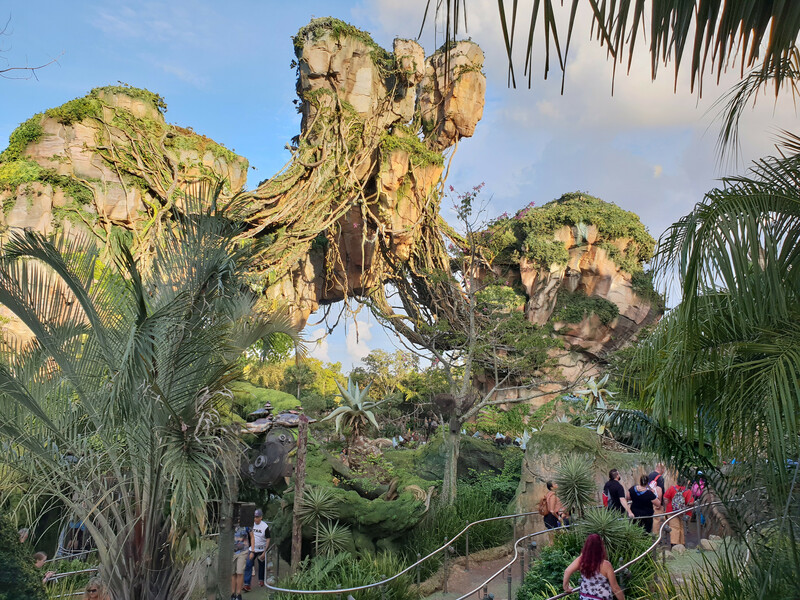 Whilst at Animal Kingdom i was able to pre-book Na'vi River Journey, Expedition Everest and Kilimanjaro Safaris. I spent an hour with the app, figuring out what seemed to be a complex puzzle before giving up. Given the resort is twice the size of Manhattan and I have no idea where I'll feel like going, I've pre-booked for 2 days attractions and will just wing the rest. One day was simply because it was the only day with either of the Avatar attractions available, whilst the other is at Magic Kingdom, which will just be crazy busy regardless. Normally I'd recommend booking all meals at Disney, as at both Disneyland and Disneyland Paris it is pretty much essential. But with too many options and not wanting to be stuck to a schedule, I'm betting on quick serve and worst case going over to Epcot Food and Wine each night. Universal seems much easier. The hotel gives me front of the line passes for the duration and priority access to some of the restaurants. I'm currently 1 mile away from the park. The drive time is currently 7-10 minutes with low to moderate traffic. It's literally a 4 lane straight and direct road from where I am to the park. It's expected that the drive time at 6pm will be 20-50 minutes. Bare in mind it takes me 40-50 minutes to travel 35 miles, including the M25, from home to Thorpe Park. Walking is 35 minutes and includes literally crossing at motorway entrance and exit ramps. There are crossings marked, although it's an advisory and not a cars must stop crossing. Then some bonuses. Operations could be single trains. The park is likely to be extremely busy. Finally, the crowd last year managed to out-do anything Alton has seen on its worst Sunday's during Scarefest, with gangs carrying tasers robbing people and guests literally climbing the perimeter catch fence to get out. After all of that I'd only have a couple of hours there, as my flight out of here is at 9am tomorrow. It's safe to say I'm looking forward to the first theme park of my trip: Universal Studios Orlando. So Halloween Horror Nights is awesome. Very very awesome. Even after waking up at 4am and then flying 5 hours, I didn't want to leave. But my legs couldn't take anymore. There'll be more detail later, but managed 4 houses and one show over around 5 hours. Blum House had some great scenes, plus anything that has The Purge siren in, wins my favour. Slaughter Sinema, brilliant short stories. Carnival Graveyard had some great sets and I was got by the illusion of an actor falling on me. Seeds of Extinction has me not trusting any plants anymore as basically the house was full of very camouflaged actors. The show, Academy of Villans was fun, some great laser pointer dancing. Scare zones were fun. They were smaller than I thought they'd be. Saw the Vamp '85 countdown, after which the actors jump from the stage and run into the audience causing mayhem. Sound familiar? Overall I was surprised how upbeat everything was. The atmosphere was spooky, yet with a decent tempo and everyone there just enjoying themselves. It was a cool day today, only 24-26c. So I made the most of being able to get around and explore. Ended up doing pretty much everything in Universal Studios, even after starting at 11am, although with Express helping a fair bit. (If I'd been there at opening, the queues were shorter than 10 minutes for everything until 11am). First up, I did Rip Ride Rockit. It hurt and I won't be needing to do that again. It's strange that it can hurt, given it sounds incredibly smooth listening to it and it has a lap restraint. But wow did my neck hurt after, far worse than anything Saw has done to me. Photo has the bonus of showing the Stranger Things cattle pen. Race Through New York Starring Jimmy Fallon was empty, meaning I skipped a fair amount of the internal queuing system, only waiting for one full Rag Time Gals performance. For what it is, it's reasonably fun. Essentially a larger version of Star Tours. 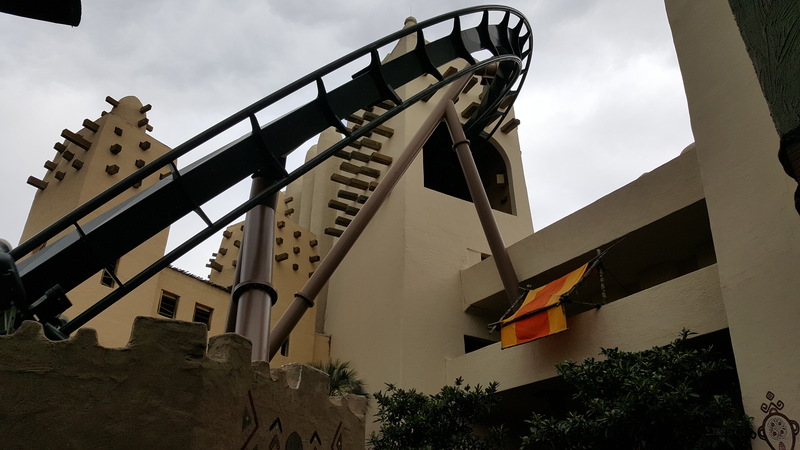 Revenge of the Mummy, an indoor themed rollercoaster done right. A different layout to the one in Hollywood and I felt the flow to be not as good. The scarab scene lacks everything great about the Hollywood version. But it seemed you could see more things inside and some of the other effects were really good. Transformers is still fun and I believe exactly the same as Hollywood, as is The Simpsons Ride. ET is a fun little attraction with a unique car (bicycle), although I didn't understand why they went to the effort of giving everyone an intergalactic passport (swipe card with your first name associated to it, programmed by a team of staff), when you just carry it, give it to the attendant as getting on the ride, who scans them in a random order and you never see them or anything associated with it again. Meanwhile, Men in Black was fun, although I seem to not be shooting the correct things. These pumpkins in the trees look just as good in the daylight too. Fast and Furious: Party Bus or something. In the space of entering via the "zero minute queue" and getting on the ride 30 minutes later, after all of the internal "not-a-queue" queue, I ended up hating the attraction. By the time I'd ridden it that hate had been completely removed. And replaced with contempt. Vehicles are good, but you just drive round into a sound stage, where the effect of a huge 360 degree IMAX style projection works well, unless you're sat on an edge seat and can see the lit roof of the warehouse. Beyond that the whole premise of the thing I felt was bad. Really really bad. 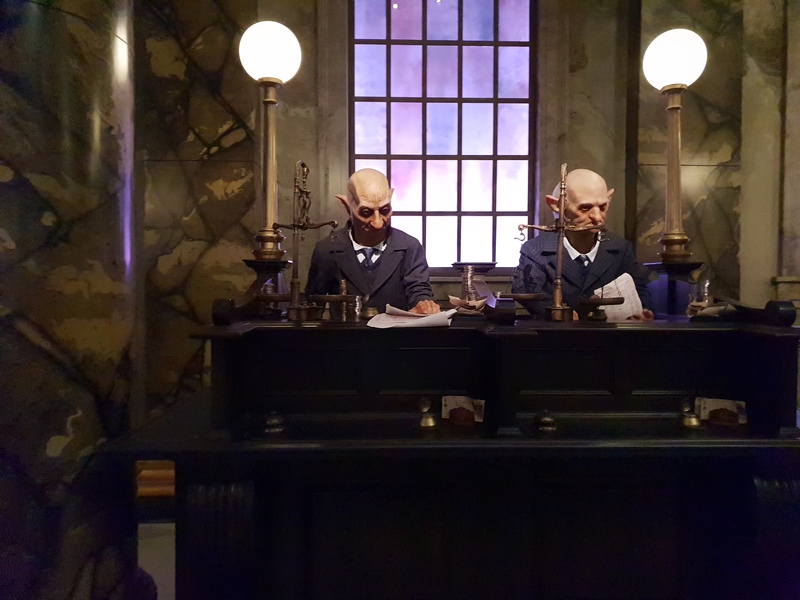 Escape from Gringotts was one that surprised me. I know nothing of Harry Potter, but from all the people dressed in academic gowns or Hogwarts ties, it appears I'm very much in the minority. In short, the ride system is essentially a modernisation of that used in Revenge of The Mummy. From seeing the patent on the new Disney Guardians of the Galaxy coaster, it feels like Universal got there first. In terms of a theatrical ride, it beats everything else out there. Yes it is predominantly screens, however the interaction with the ride system is fantastic. 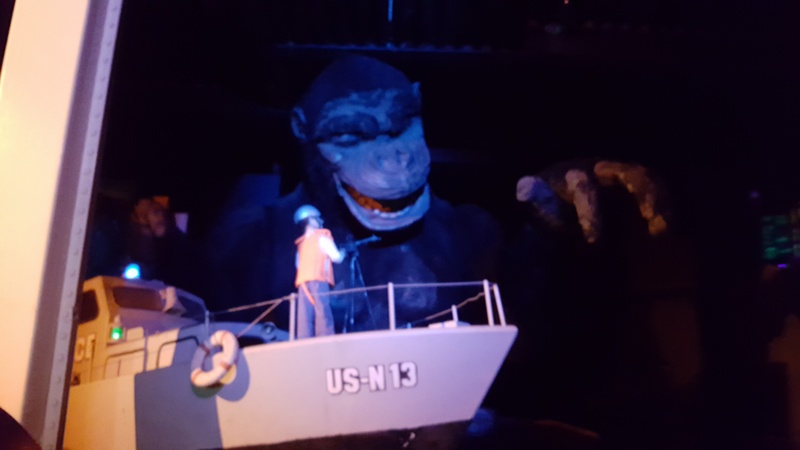 It surprised me as probably my most enjoyed attraction at the entire resort. The train over to Islands of Adventure is wonderfully done. A lot of screen effects, but some are spectacular. A 120 minute standby line though, when it would take you barely 20 minutes to walk, is a bit much though. Very glad to have Express there, making the line about 20 minutes. And finally Hulk. A very fun and smooth ride. My first B&M normal sit down coaster, the seats were incredibly comfortable and the redone track is super smooth. It's smaller than I thought it would be though, with the main complex part and then several tight turns in a back lot that's mostly mud. I ran around for a second go whilst I had time left on my locker and will no doubt ride it more this week, but I felt a little underwhelmed by it. It kinda felt to me that the second half is incomplete. Just some track twisted around because of reasons. 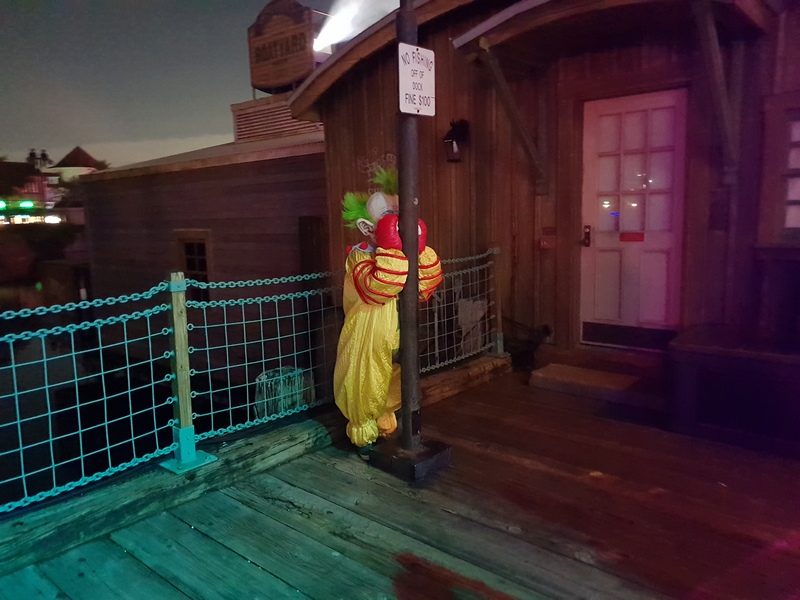 And because I didn't put much up about my first visit the Halloween Horror Nights, here's a clown hiding behind a lamp post. Long day at SeaWorld followed by an evening at Halloween Horror Nights. Turns out Sunday is the busiest day for Horror Nights this year, with hotel guest priority access for entry being used and the shortest average house queue being over an hour. Stranger Things was listed as 3 hours at one point, and never below 2 hours, meaning I'm still yet to experience it. Managed two houses when they briefly posted 40 minute queues. 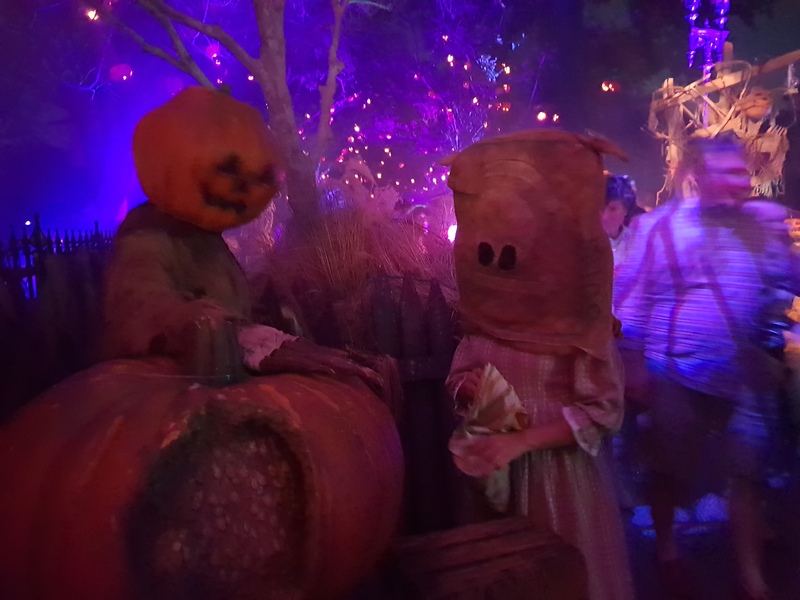 Trick 'r Treat was a fairly standard HHN house in terms of its operations, but the set design was extremely good and there is an awesome Werewolf half way around. Meanwhile Dead Exposure: Patient Zero is the parks only zombie attraction and is based around an outbreak of something at a research lab and the health authority failing to contain it. Unlike Dead Creek Woods at Thorpe, which has the near same description and logo, it's actually an intense experience due to the continual strobe effects and loud noises the whole way around. Parts reminded me of 28 Days Later, especially the start walking through a room full of animal cages with things jumping out at you. I have no idea how the actors manage to not have a seizure working in there though. I also noted that the park makes mention of "most houses ever" on some of the internal advertising videos. I've seen that used somewhere else... .
Oh and Mako is super awesome. Rode it 4 times in a row this morning, with walk on queues. In comparison to other rides: I have no issue with having my hands up all the way around on Stealth, Taron or pretty much any other ride. I'm yet to do it on this one though, the airtime is superb and the restraint never feels secure enough . And now a story of how the Transportation and Ticketing Center is not your friend. As Magic Kingdom was rammed, with Pirates being an hour queue and Jingle Cruise nearly two, I decided to move to Hollywood Studios. The Disney app is meant to be able to tell you the route to take. Spoiler: it does not. So instead I used the various online guides, because Disney haven't provided a simple route map. All the guides, including one dated from last year, have the same answer. Take the monorail to Transportation and Ticketing and get a bus from there as Transportation and Ticketing acts as the main bus hub. Spoiler: it isn't. Arriving at the center, I go out to the bus area and whilst there are busses, there are no information boards and most look parked. A helpful sign for bus information led me to the most un-Disney person, who just said Magic Kingdom, when asking how I get to Hollywood Studios. Later a more helpful cast member told me that Transportation and Ticketing hasn't been the bus hub for about 6 years. Thanks internet! So my route went: Monorail from Magic Kingdom to Transportation and Ticketing. Monorail from Transportation and Ticketing to Epcot. Walk from the front of Epcot to the back, via the Australia Food and Wine stand to pick up my favourite cake. Ferry from Epcot to Hollywood Studios. Total travel time: 2 hours. During my adventure I went through security three times. Moral of the story is: don't trust the internet. 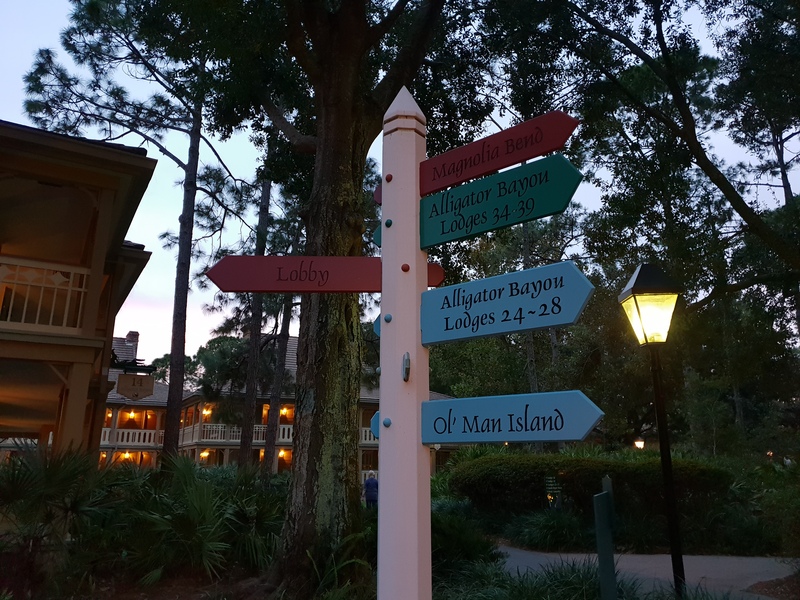 And if you're traversing the Disney World estate to get to another park, go from wherever you are to a hotel and there will be a bus from there to wherever you need to get to. Or go to any of the other Disney properties across the world. They're all easier to navigate and overall a little bit nicer. But that's a story for a different day. Enjoyed reading this whole thread Chris. Can’t wait for May, got a week booked in Germany, Hotel booked for 3 nights at Europa Park (hotel Colosseo) and planning to book a night or 2 at Phantasialand and a couple of nights elsewhere. 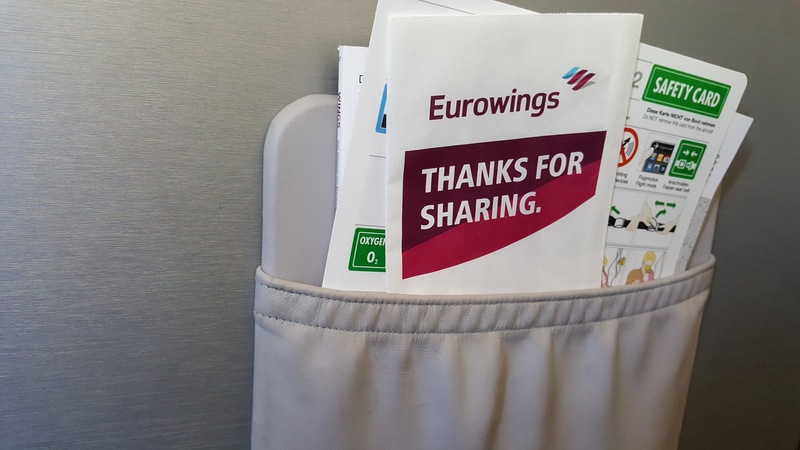 Thanks, and have fun at Europa and Phantasialand! 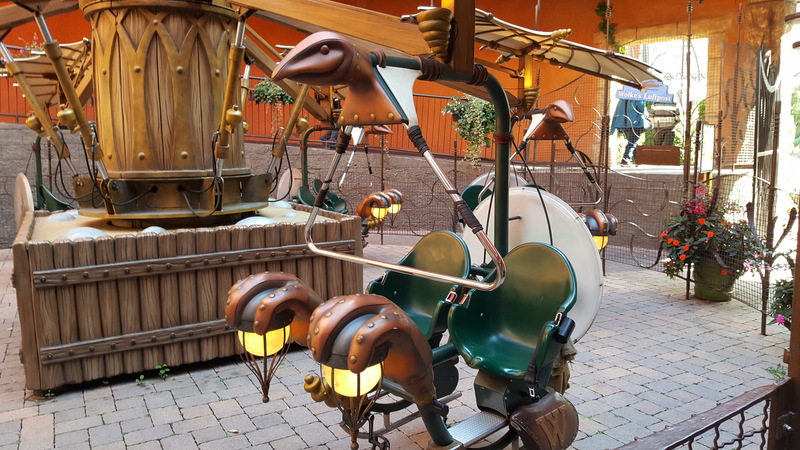 Keep an eye on any ERTs the park hotels offer at Phantasialand. The hour long Taron each night was brilliant, but it doesn't operate all year around. Meanwhile at Disney World, my trip to Animal Kingdom yesterday rescued my slightly negative trending feelings over Disney World. 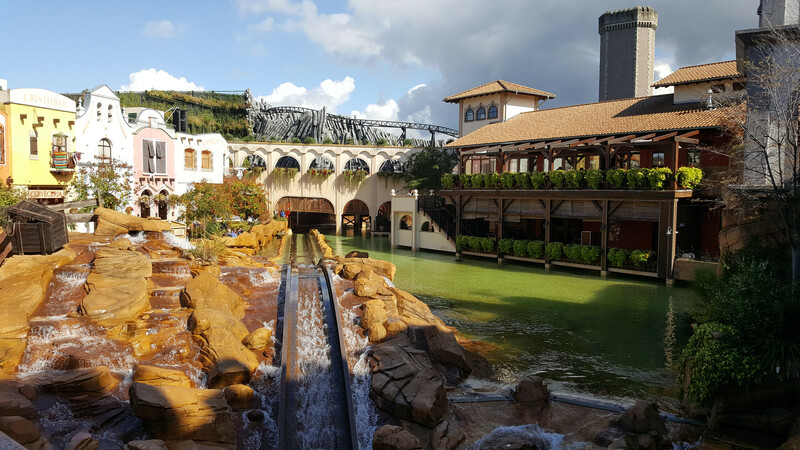 A brilliantly themed park and a much more relaxed atmosphere. 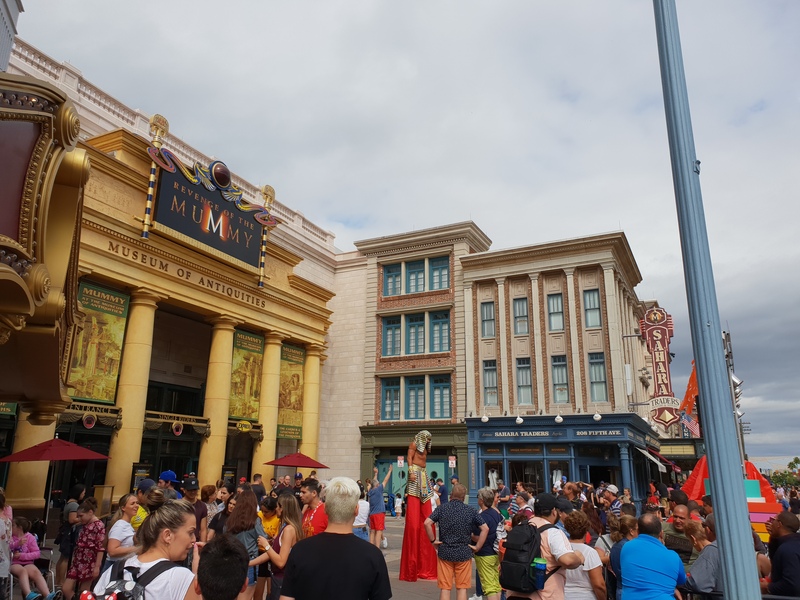 It was crazy hot (26c and 70% humidity at 9am) and crazy busy in Hollywood Studios (Tower of Terror 120 minutes) today, in part caused by Magic Kingdom closing at 16:30 and no one wanting to waste their day there. So at about 1pm I decided to move from Hollywood Studios to Magic Kingdom. Coincidentally I did a lot more rides at Magic Kingdom than I did, and would have been able to achieve, at Hollywood Studios, including Seven Dwarfs Mine Train. It's a short and twisty little roller coaster with a fun interlude, but it's party trick is the tilting cars. 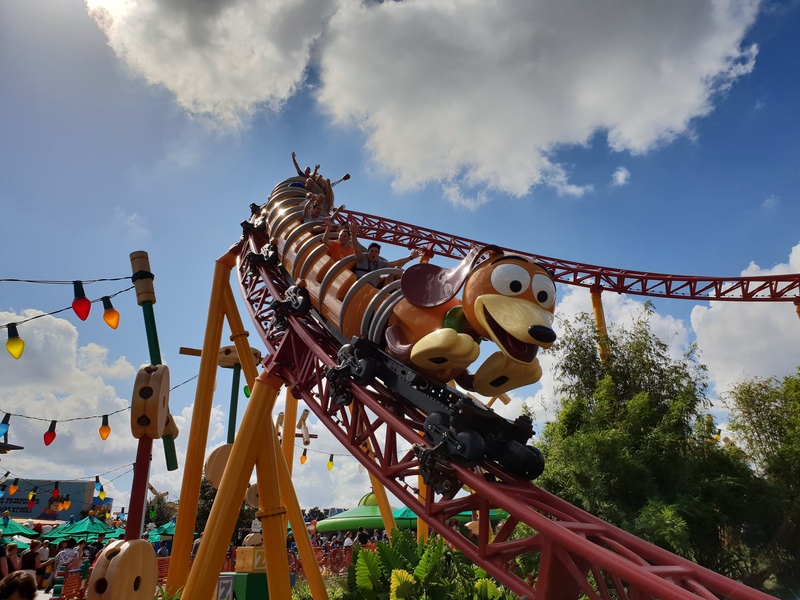 It's somewhat like a light version of a suspended swinging coaster, as the cart banks into the corner beyond the track banking, making a smooth and fun ride. Plus, if you're wearing your Magic Band, there will be a surprise on your phone when you get back to the hotel. With the park closing at 16:30 and management trying to shove everyone out the door as fast as possible, it meant that the transportation was overwhelmed, even with the lower crowd numbers. My target destination was Disney Springs, the restaurant, shopping and general entertainment district. But, the queue for the Disney Springs bus was easily 6 or more busses long, corresponding to probably an hour or more wait. So, I tried out my idea of taking a Disney transportation bus to a random resort, to connect with the transportation there. Wandering the bus station I found the shortest queue was going to Disney's Port Orleans Resort - Riverside. From there I had the option of bus (boring) or boat (yay) to Disney Springs. At my hotel, the bus stops right at the main lobby entrance. At my chosen resort, this is not so much the case. 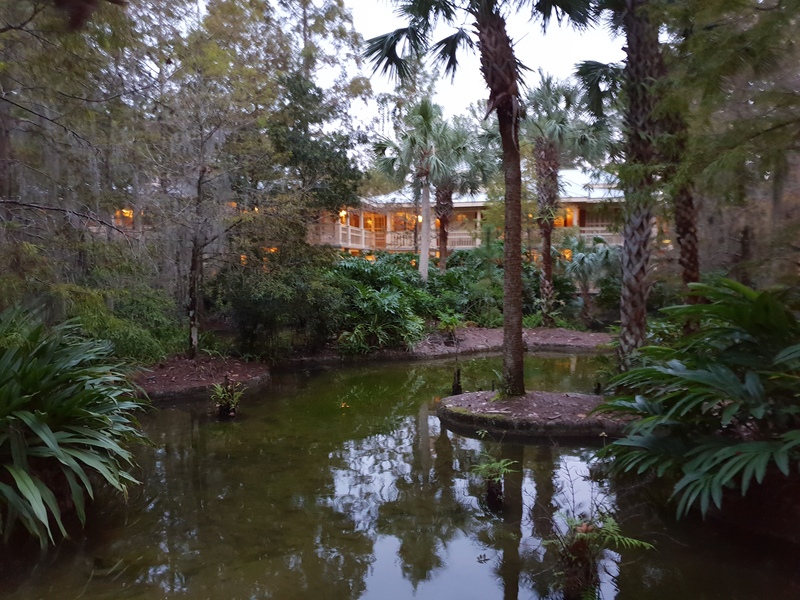 About a 15 minute walk through the bayou style resort. Thankfully about 5 minutes into the walk there were signs to the lobby and I assumed (correctly) the dock. It has some fun Disney theming. 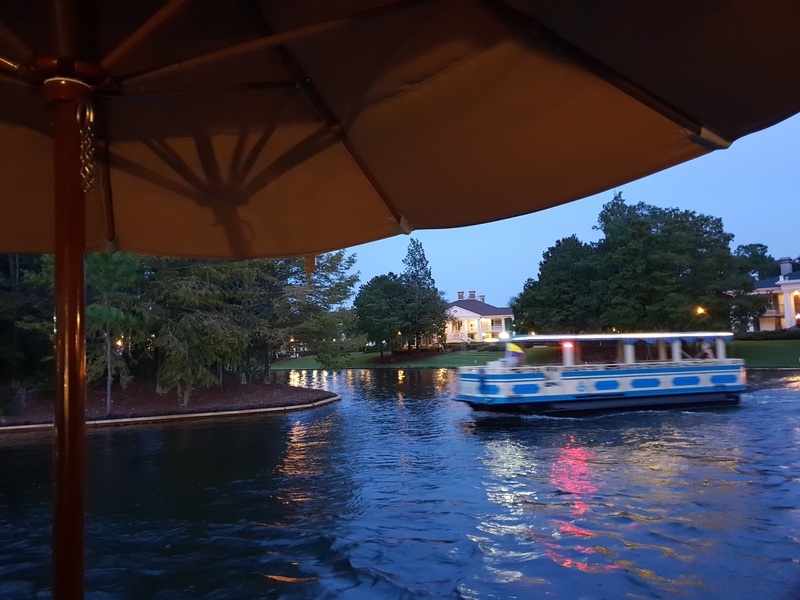 The boats at this resort are much smaller than those over at Swan and Dolphin but they're also more open and a little faster. This made the 20 or so minute ride really fun and relaxing. 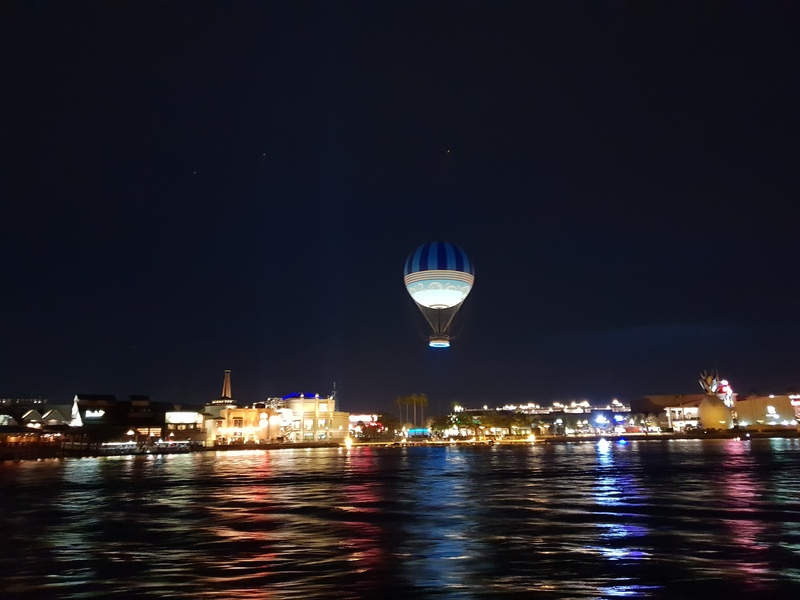 Plus I got a great view coming into Disney Springs. It took me somewhere between 90-120 minutes to get from Magic Kingdom to Disney Springs, but it was the best continual 90-120 minutes I'd had all day. So the moral of the story is: believe what you read on the internet and take an adventure on Disney transport. Just don't go to Transportation and Ticketing unless you're parked there, or are switching between Magic Kingdom and Epcot, because that place is just miserable. Tired, exhausted and thoroughly happy after this trip. Flight is not for another 7 hours at 6:30pm, but I have absolutely no desire to go back out into the Florida heat for final rides, so for the first time in two weeks I'm just sat, in a hotel lobby, doing my best to not fall asleep. 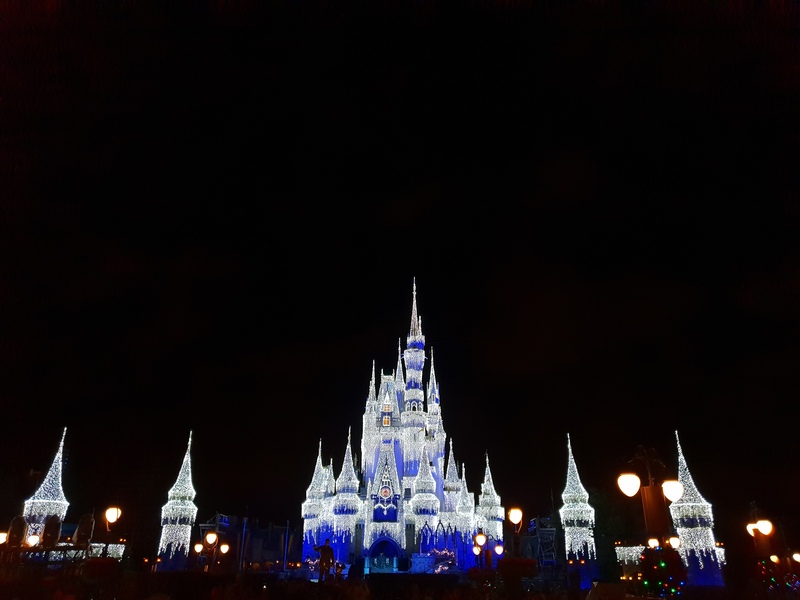 An earlier post gave an indication that Disney World wasn't living up to some expectations I had from visiting the other parks, and that's partially true. However after a couple of days, it did provide a true Disney experience. From fantastic rides, countless shows, many meet and greets plus the overall atmosphere and Disney magical moments, it was a truly great experience. What wasn't great, and this is what I came across more at the start than at the end, is perhaps some of the parks visitors. 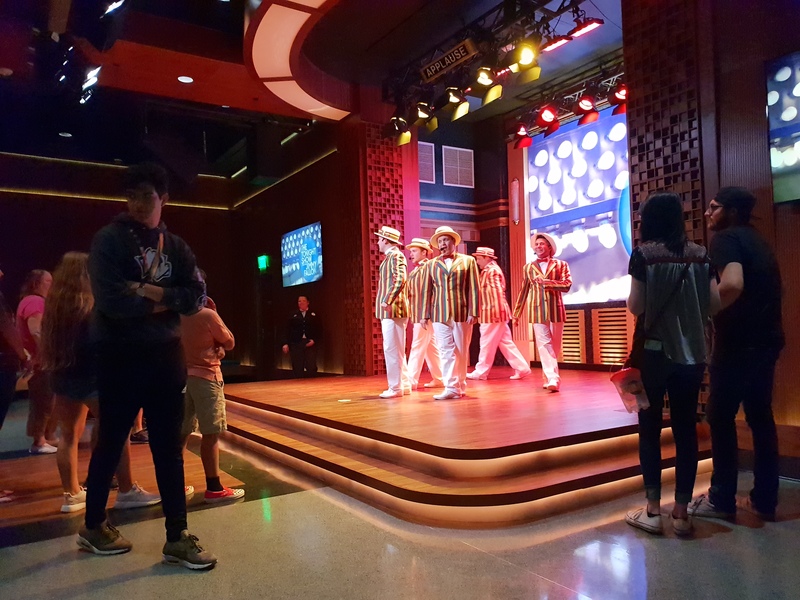 At the Disneyland's in Anaheim, Tokyo and and Hong Kong, it is predominantly locals who go there for fun and the parks have a very relaxed atmosphere. Similarly, Paris in the off-season is very relaxed. 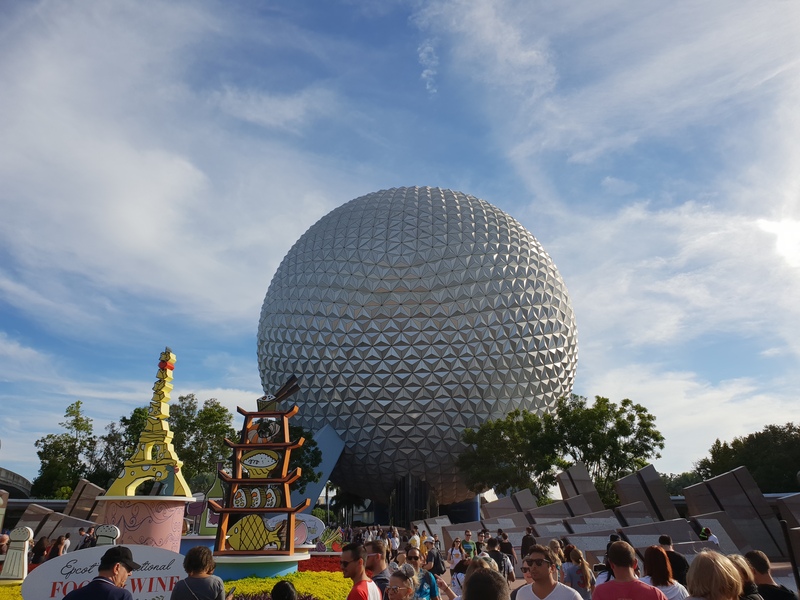 At Disney World, a large number of people arrive from across the country and world to have their best experience ever, and they push very hard to get everything they want. It meant at times the atmosphere was not always as relaxed, especially in Magic Kingdom, and I came across a lot of squabbling groups who had perhaps pushed a little too hard and were very hot and tired. Animal Kingdom is by far my favourite of the parks. It is exactly what Disney should be, it's own little world. 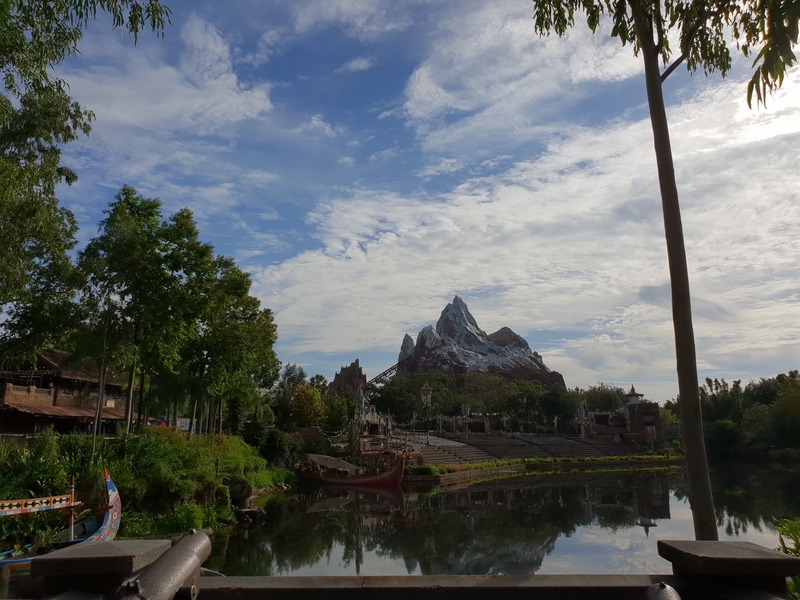 Expedition Everest looks amazing from wherever you can see it, the shows are great and seem to be mini versions of full Disney productions, whilst Avatar land is the most immersive set of attractions I've ever come across. The Magic Kingdom took a couple of visits to truly appreciate it. The park feels smaller than Anaheim and Paris, although I'm not sure that's actually true. I spent half a day just in Adventure Land doing treasure hunts, rides, lunch at the Skipper Canteen and generally taking in the ambience. 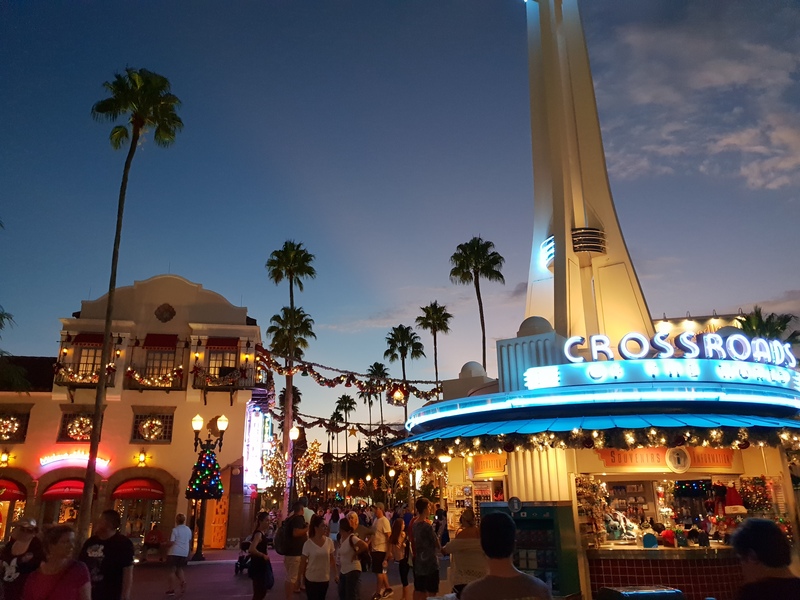 Hollywood Studios is far better than the Hollywood park at Disneyland Paris, with the evening Christmas lights looking amazing and the occasional hidden reference to Disney California Adventure. Epcot is massive and has a lot of things to look at. The Food and Wine event was a nice bonus with tasty food from around the world. Although I didn't really feel like being in a Disney park in the wide open and mostly empty spaces in Future Land. So now back to the UK, cool down from the 33c and 70-80% humidity that still exists in November, and sleep. Lots and lots of sleep. More about Halloween Horror, Universal and other parts of Disney trip and trip planning will be along soon. 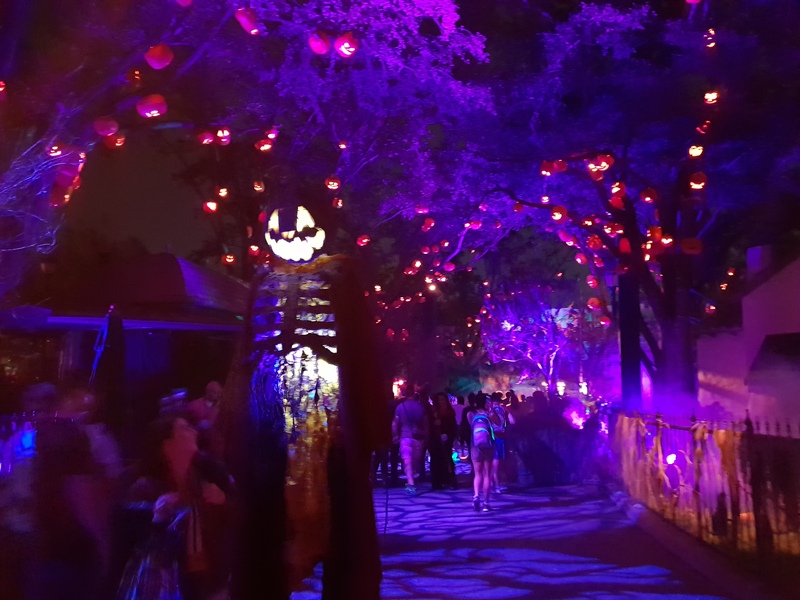 My Halloween events have been somewhat limited to just those at Thorpe Park and to be honest, my mind was still being made up as to whether I enjoyed the events. 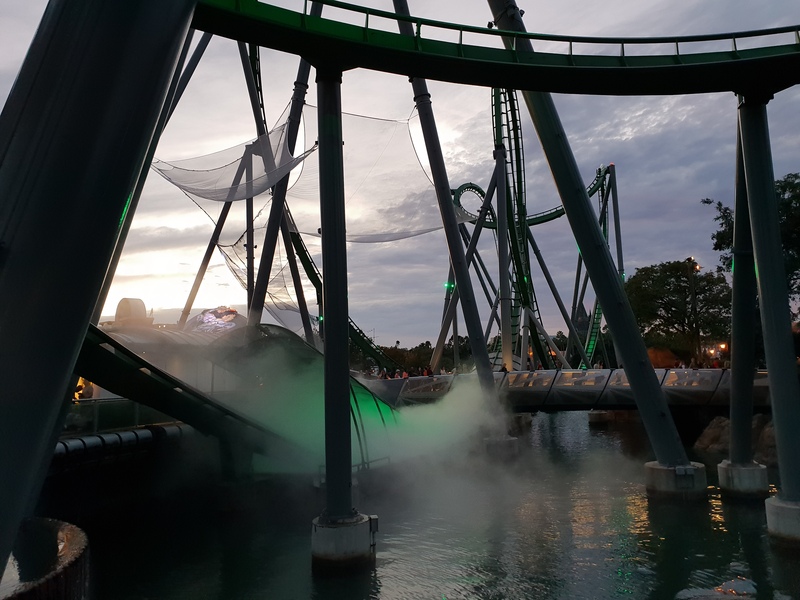 This question of enjoyment didn't come from a too scared point of view, but more from a do I find this entertaining view, where several times I came away from attractions thinking, well was that worth the wait? With this in mind, I hesitantly bought a season pass to Halloween Horror Nights over a single admission ticket, with the thought that worst case I can go for a few hours and leave. Five visits later and leaving the park at 1am a couple of times, I can say without hesitation that Halloween Horror Nights is a great experience and one that I look forward to doing again. So with that, here is a little bit about the 10 houses, 5 and a half scare zones, 1 show and an assortment of tasty treats. 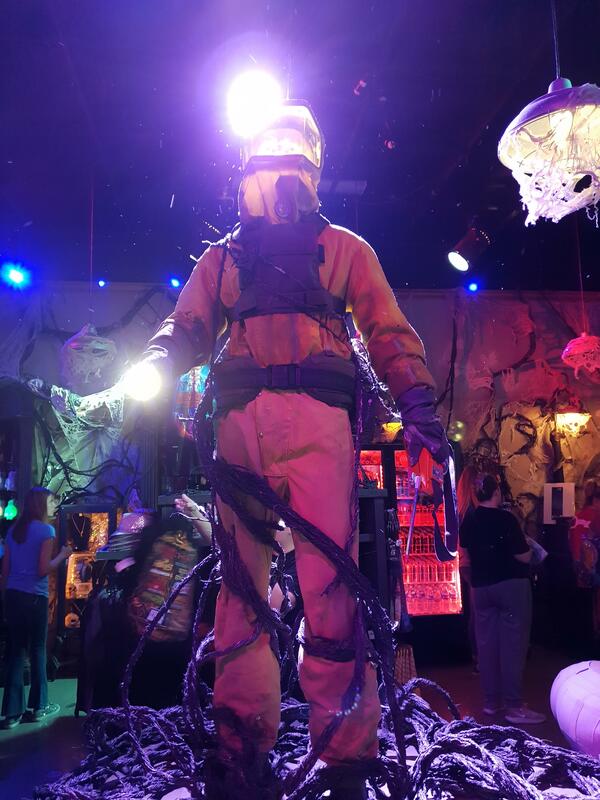 The headline act for Halloween Horror Nights, the Stranger Things house had the longest lines, typically upwards of 120 minutes. 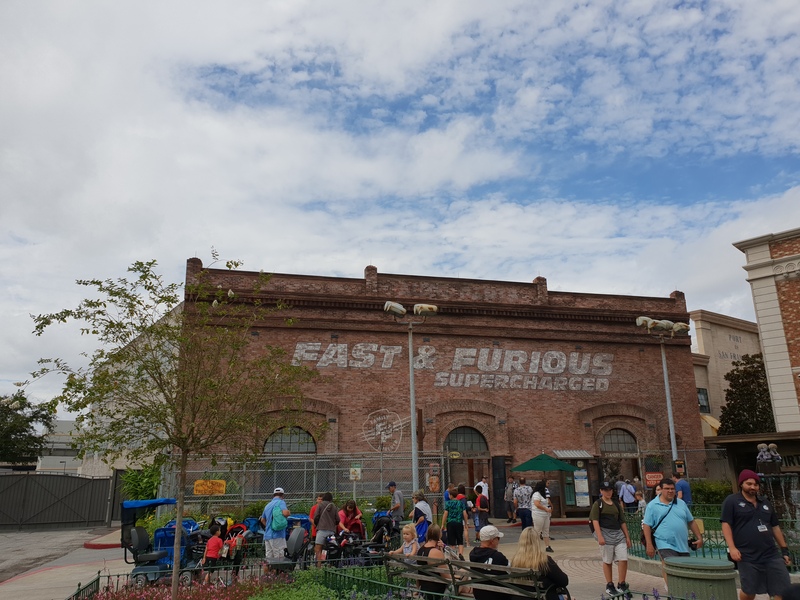 Although I was lucky to also be there on a bonus day Universal added to the event that was quiet, meaning the queue at one point reached 45 minutes. Inside the theming was exceptional, taking you through the locations of the first season: the forests of Hawkins; the labs; the Byers house; the school; and of course the upside down. In each were a number of jump scares, with the demogorgon stalking you, but there were also a number of character pieces where they had actors who resembled enough the majority of the Stranger Things cast - both adults and children. Of course, if those set pieces could get a jump scare - then that was a bonus, where I saw someone get completely scared by Jim Hopper, whose scene was actually meant to be him helping you. 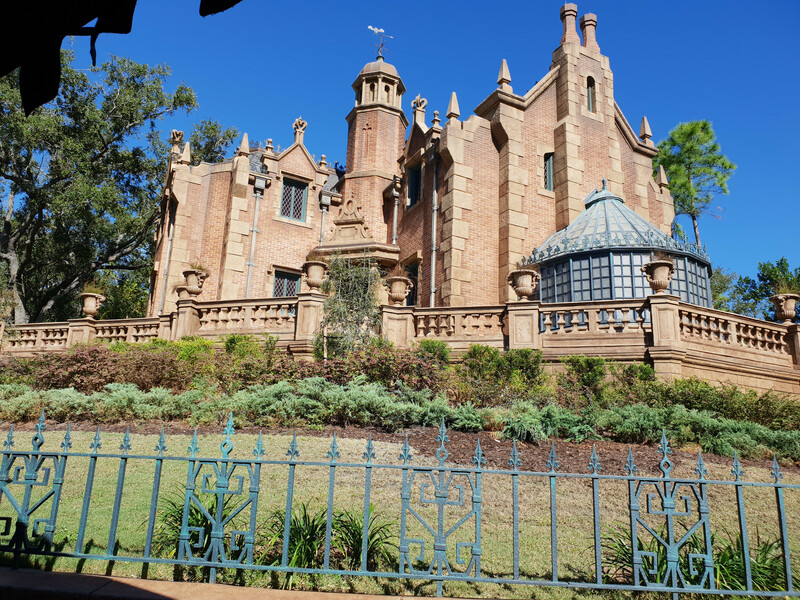 Of all the houses, this was the most scenic and themed house, with the number of potential scare points being quite low, although a demogorgen very early on in the house did get me. As expected, no photos are allowed anywhere near the house, however there was a scene within the Halloween Horror Nights shop, which gives a good representation of some of the houses theming. Especially the tiny bubbles they were using within the upside down. 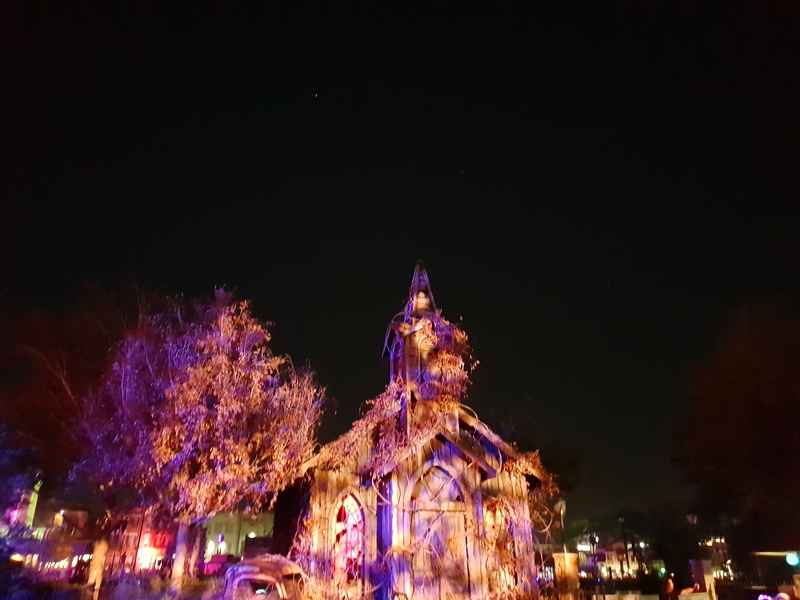 Set in an area that has been hit by a meteorite, causing a massive change in the environment and a rapid evolution of the plant life, Seeds of Extinction was my favourite house of Halloween Horror Nights. Unlike the majority of houses, which rely on jump scares caused by actors who are hiding in cupboards or behind doors, in Seeds of Extinction the actors can be stood right in front of you but you wouldn't know until they moved. With each actor in bushy camouflage and the house containing a huge amount of foliage, this was one house where I didn't trust a thing. From large bushes that would suddenly move, to snapping carnivorous plants coming out of a bush, it was a simple and somewhat repeated experience, but to great effect through the varied and interesting scenes. I should also say that the effect of this house stayed with me. On getting back to hotel I got jump scared by a potted shrub that was placed next to the elevator I was coming out of. A house made up of many one or two scene homages to 80s bad horror B-movies, Slaughter Sinema was my second favourite house and the one that I probably visited the most. Starting from the queue, where a large drive-in movie screen plays appropriately cheesy trailers for the movies including: Attack of the Swamp Yetti; Devil Dogs (wherewolf biker gang); and The Cult of the Beast Baby, the house had a playful energy not found elsewhere. Inside each room had an incredible amount of details, from a biker bar with pinball machine, bottles and chairs, to a laboratory with a bunch of critters feasting on a body, their heads moving up and down, chattering away. 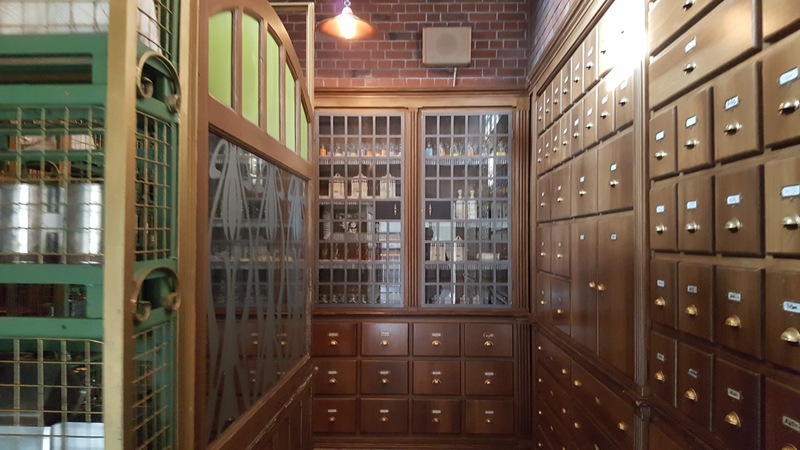 Each room was varied as well: from a sorority dorm room, to a cultist ceremony, to a science lab with a giant eating thing, to finally a swamp. Each time was different and it was a brilliantly fun house. A 2-for-1 experience, with the first half of the house being from Happy Death Day and the second half being from The First Purge. For me the first half was stronger than the second, with it playing out the waking up scene several times as in the film. The second half was a slightly more by the books jump scare type maze and didn't really do much to make me think of The Purge, other than the siren and announcement at the start. Halloween Horror Nights' only zombie attraction, this was a pretty intense experience. Set in Paris, you begin outside entering a military quarantined area, with smoke randomly being blasted at you, in a very atmospheric environment. Inside, pretty much the entire house is strobe lit. It begins in an animal holding area, with cages forced open, monkeys screaming and the occasional moving thing. It has a real 21 Days Later vibe. Beyond that, the scenes are a little blurred due to the continual flashing lights, loud noises and screams. It was a sensory overload, where I came out exhausted, but not entirely sure what exactly just happened. Consistently the house with the shortest queue, it seemed few people were interested in seeing the extremely large number of pumpkins this house had on display. More great set design, with you first entering an old wooden house that appears fully constructed within the sound stage that this attraction exists in. I did this house twice and honestly don't remember too much more, other than the house at the start and an awesome werewolf scene later on in my first run through, which I somehow completely missed on my second. Given this had a walk-on queue a couple of times, I could have done it more, however the literal 5 minute walk to the house along the queue and then the 5 minute walk back afterwards, was too much for my tired legs for the reward of the attraction. Set in a twisted fairground, where the rides and sideshows have been adjusted to become torture devices. The size and scale of the set pieces were like all of the houses, incredibly impressive. One difference this house had over most of the others was its verticality. In two scenes actors were above your heads, with one simulating falling on you - which I fell for - and another throwing containers at you as you pass underneath. Another fun house. The untold dark sides of fairy tales. It begins with some great aerial work with the Wicked Witch of the West leaping from above you as you enter the entrance castle and circling around over you on the wire she is attached to. Inside are a number of fairly tales gone evil, with adjusted endings to some, including Humpty Dumpty. Again, not a scary house as such, but one with great atmosphere and smells. This was a house that consistently had a two hour queue for and one that people said was perhaps the best house at Halloween Horror Nights. For me though, I walked in, I walked out. Nothing really stuck with me. I suspect I had a bad run on this house, mixed with being somewhat exhausted. A shame given the views of others that I heard, but overall I'm not disappointed, as I got so much from Halloween Horror Nights as it was. A series I know nothing about, but a house that also typically had one of the longest lines. Like Poltergeist, not much really stuck with me on this one. Some people jumped out at me, I carried on walking. At the start I said there were 5 and a half scare zones, so I'll begin with the half. Essentially there is a gap between the front of the park and the back of the park, where they're unable to do much. So they stuck various crazed people there with chainsaws, to ensure that the crowds moved along at a moderate pace. Not an official scare zone, but it had actors and a lot of people screaming and running. 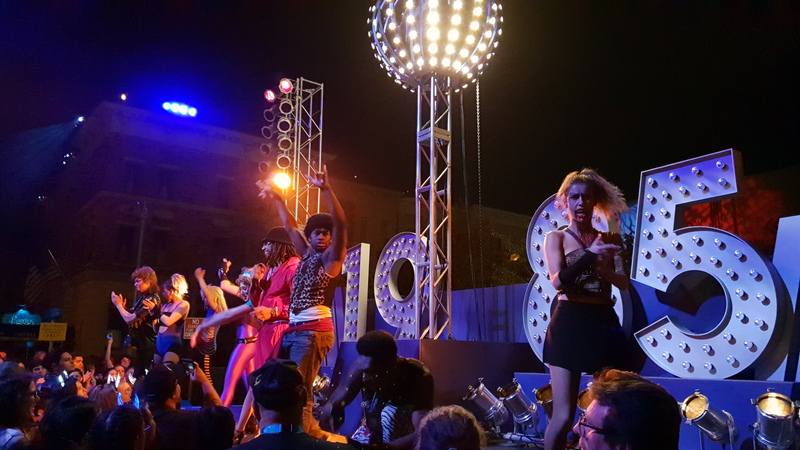 A stage, a new years party, an MC, some reporters - oh and a load of vampires. What more could you want? Roughly every half hour a new years celebration would occur, which followed a similar format. A vampire taking the role of the MC would lead the celebration by bringing on a group of vampire dancers. A reporter and her camera man would be wandering around and visit the stage, where she would be brought up. The countdown would occur, and on zero the MC would feed from the reporter and the vampire dancers would run into the crowd. The music was loud, energetic and heavily banned from being hosted on YouTube - it's an instant video block, which is sad because this was a great event to watch and would have been great to share. Added to the vampires already mentioned, were a host of party goers, vampire Prince, vampire Michael Jackson and a vampire turning up on a motorbike. I spent a long time enjoying the festivities at Vamp 85. I spent too long here. Way, way too long. 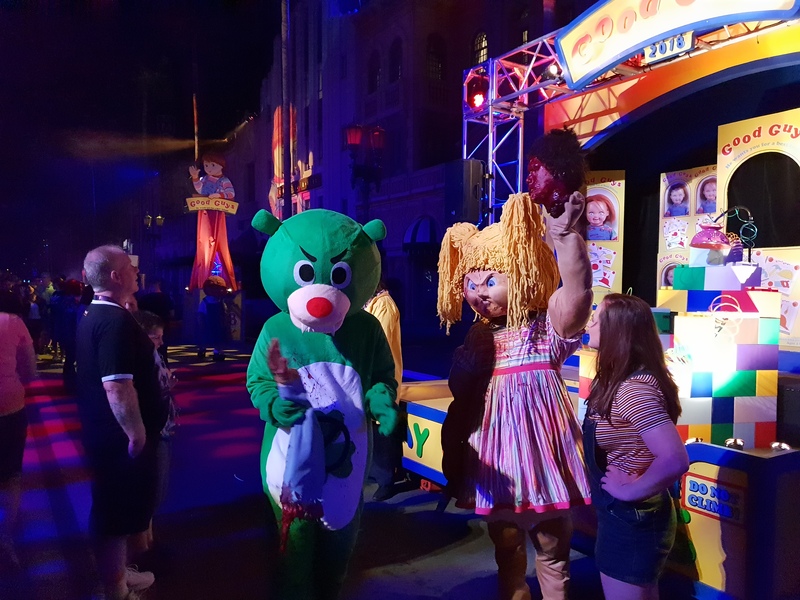 Set in the streets of Hollywood, the Chucky scare zone had a large number of roaming toys, including evil teddy bears, green army men, toy monkeys and ballerinas that stalk you whilst they dance. 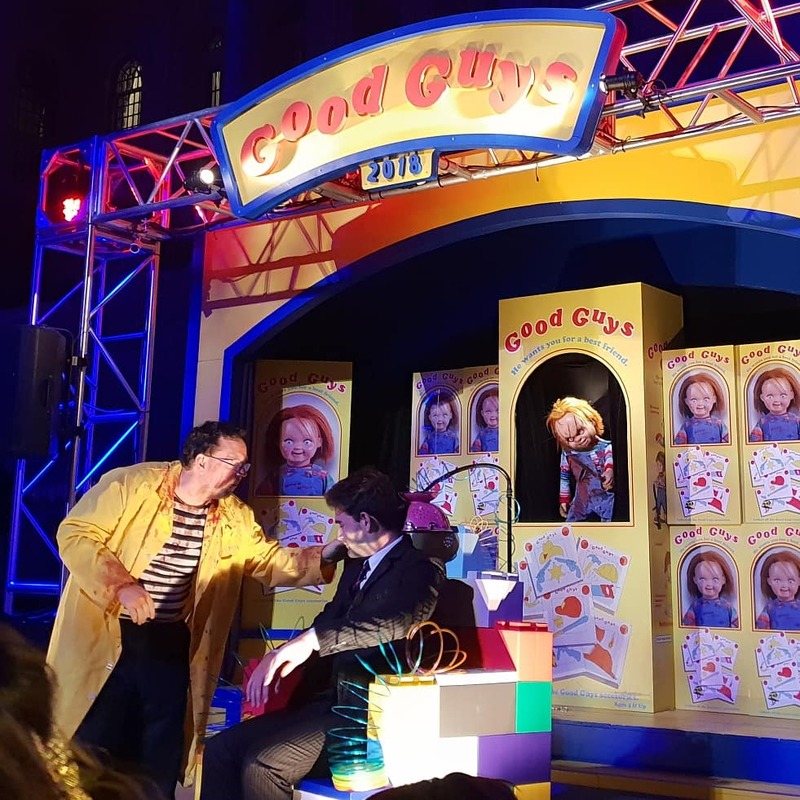 Then there were the side shows, including: a recreation of the operation board game, just with a slightly more alive patient; an easy bake oven with someone inside it; a barrel of monkeys; and of course Chucky. Set as an audience with Chucky, the murderous doll would frequently hold a question and answer session, where you could get advice such as "how can I get a man?" and get brilliantly funny and evil responses as you can see in the video [viewer discretion is advised]. Each question was genuinely from the audience, with responses ad-libbed. Just be sure not to use the opportunity to show off that it's your birthday, or that you're getting married, as Chucky doesn't like that and will refuse to continue until the offending party has left. Mixed in with that was the occasional swearing in ceremony of the audience to the cult of Chucky, electrocutions of toy maker CEOs and a good old fashioned Chucky stabbing. The humour of this scare zone made it my favourite place to hang out and take a break. Going in I knew nothing of this movie. Coming out and the sound track is burnt into my mind. The smallest of the scare zones, but with perhaps the largest character. A group of Killer Klowns wandering a street, with laser pistols and other outer space stuff, following and chasing those who don't want to be, and often deliberately ignoring those who did want a photo. All the while the sound track with "killer klowns from outer spaaaaaace" continuing in the background and a fairground theme. A hidden aspect of this maze was that if you stood on the other side of the lake, occasionally they would project a hand puppet scene from the film onto the top of one of the buildings near this scare zone - culminating in a dinosaur eating people. I have no idea what the story is here, but it had some great scenery. An abandoned church with occasional screams coming out of it. 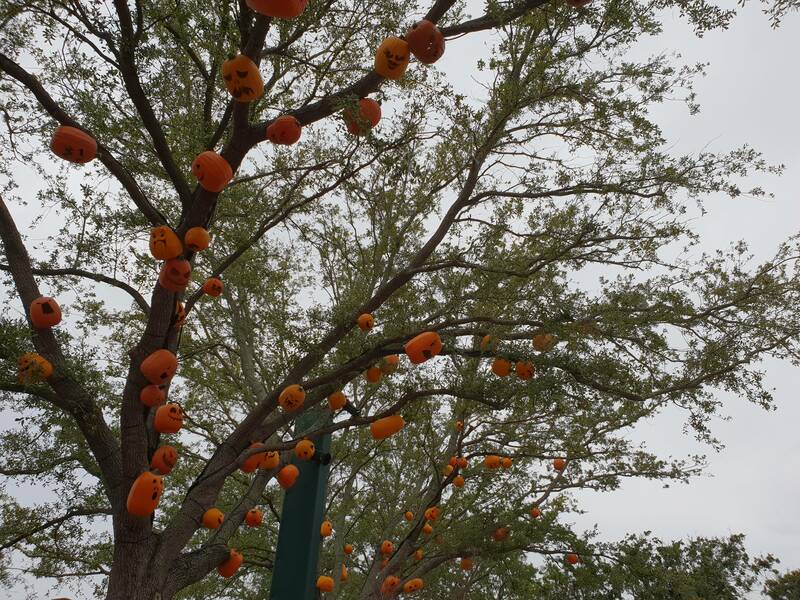 Trees covered in jack-o-lanterns. Eerie stilt walkers roaming. And women turned walking sacks, standing perfectly still for minutes at a time, waiting to get the unsuspecting person who thinks they are a prop. This was a spooky area and had some great interactions between the actors. Occasionally a group of high school kids would turn up and then be ganged up on by the creatures of this area, running screaming asking why no one was helping. Whilst another time I saw a somewhat heart warming scene of one of the sack ladies trying to teach a walking scarecrow type character how to do pat-a-cake, with limited success due to the scarecrows limited movement - her hope it could happen and the scarecrows sad inability to reciprocate was surprisingly powerful for a random encounter. 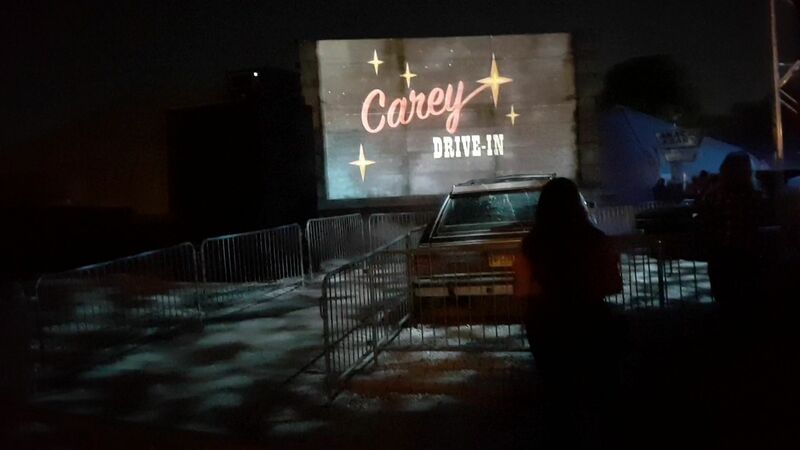 Acting as an introduction to Halloween Horror Nights, this scare zone was right at the entrance and had a small number of actors, signage and props from all ten houses. 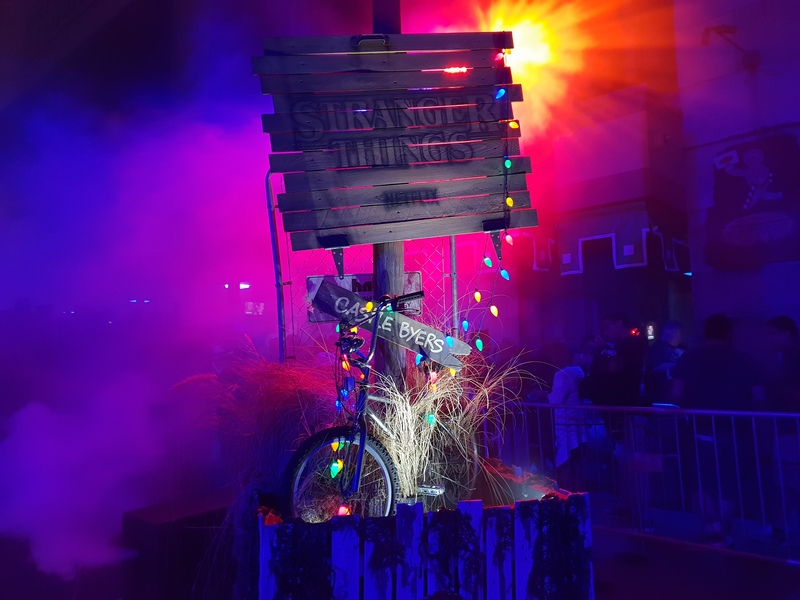 The stilt walkers from Twisted Tradition were a focal point of this zone, along with the Stranger Things sign. Along with all of the houses and scare mazes was a twenty five minute dance and acrobatics show, Academy of Villains. I saw this once and was extremely tired when I did. Like a couple of the houses, I don't remember too much, other than the performers had a lot more energy than I did and it was an entertaining way of spending the time, with loud music, audience participation and a couple of explosions. One of the entrance staff had a hugely fun time it seemed, as every time I went past they were full out dancing to the sound-track from the stadium. Universal include a range of speciality food and drink. A lot was Stranger Things themed, with Eggo's waffles making up a large number of the desert dishes. 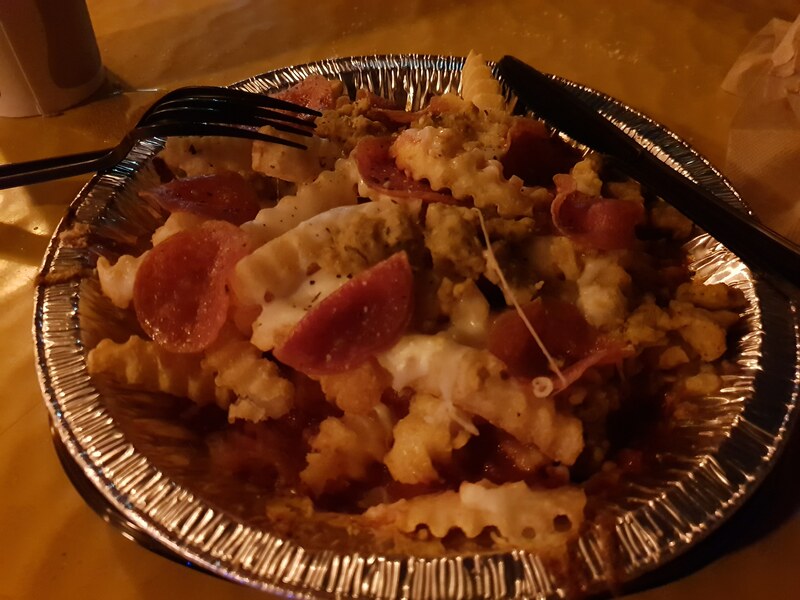 My favourite was pizza fries, basically just fries with a meat lover style pizza topping thrown on top. After all that walking, it was a great treat! The speciality burgers were disappointing, I found nothing special about those. 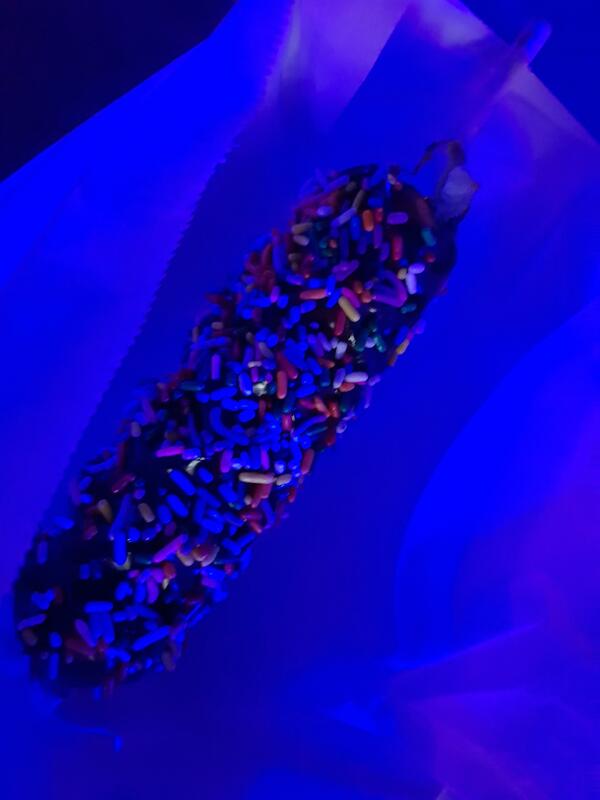 Whilst the Fudge Dipped Waffle on a Stick, was perhaps hugely overpriced! I loved Halloween Horror Nights. Granted some days were incredibly busy, with over two hour waits for nearly all houses and the pathways completely full, but even on those days I had great experiences. I was lucky to be there Halloween week, where an extra day had been added, which was nearly empty making getting into all of the houses easily do-able, along with repeats on some. But if you're there for only a single or couple of visits, you may really need to invest in an Express Pass for the event, to get you into the houses quicker. 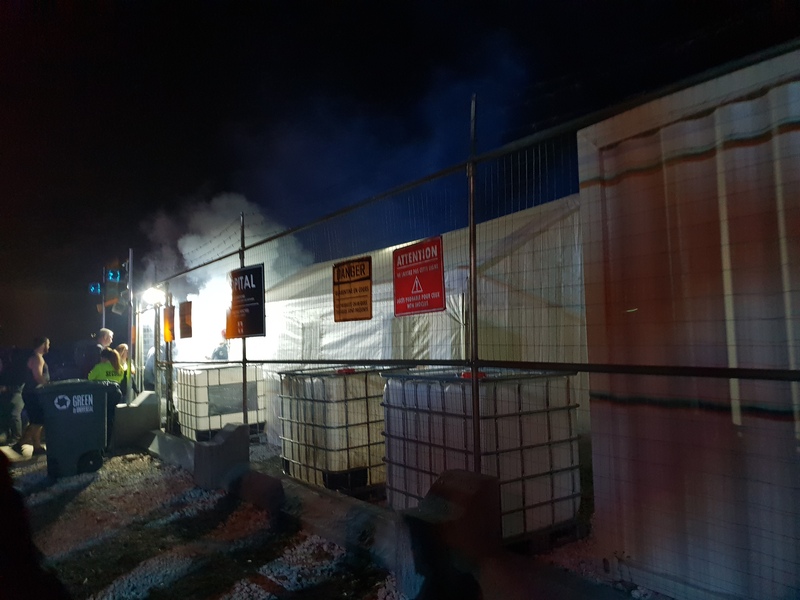 The queues can be fairly miserable and even though people were a lot more up-beat and in a somewhat party atmosphere across the park, you will be spending a huge amount of time in the cattle pens in what would normally be behind the scenes areas of the park. They're not that pretty to look at! Thankfully the houses are all of decent length and have great designs. On busy days you will basically all file through the house continually, however there are enough scare points within each house that you stand a good chance of being got by something. On quiet days, they do batch you into medium sized groups, for some bonus intensity. A great event and one that I look forward to going to again in future years!